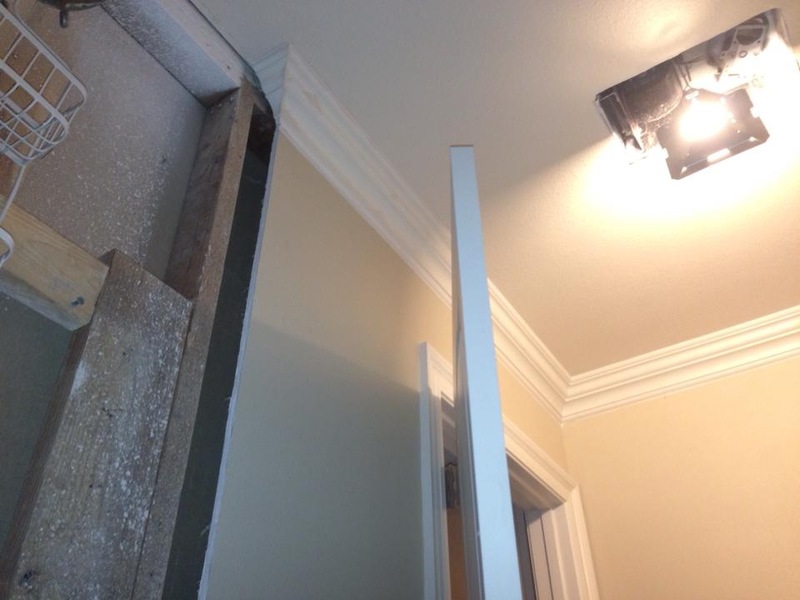 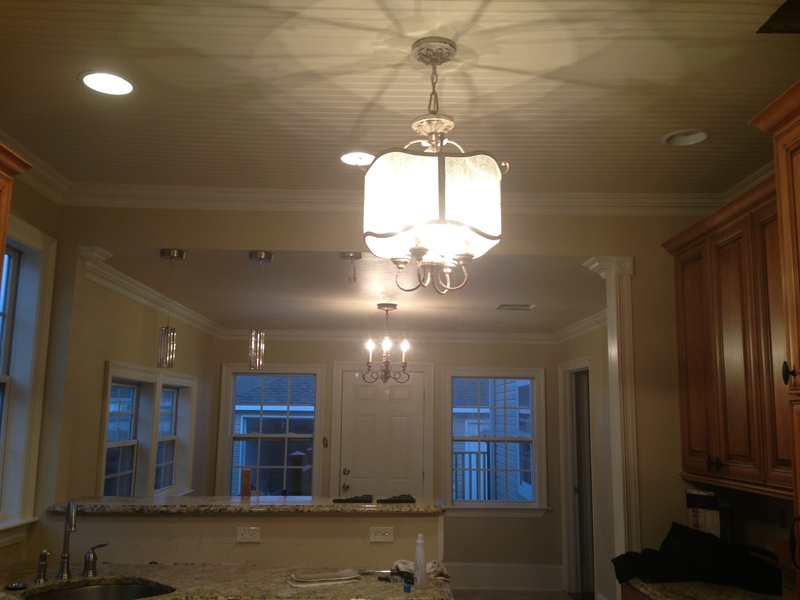 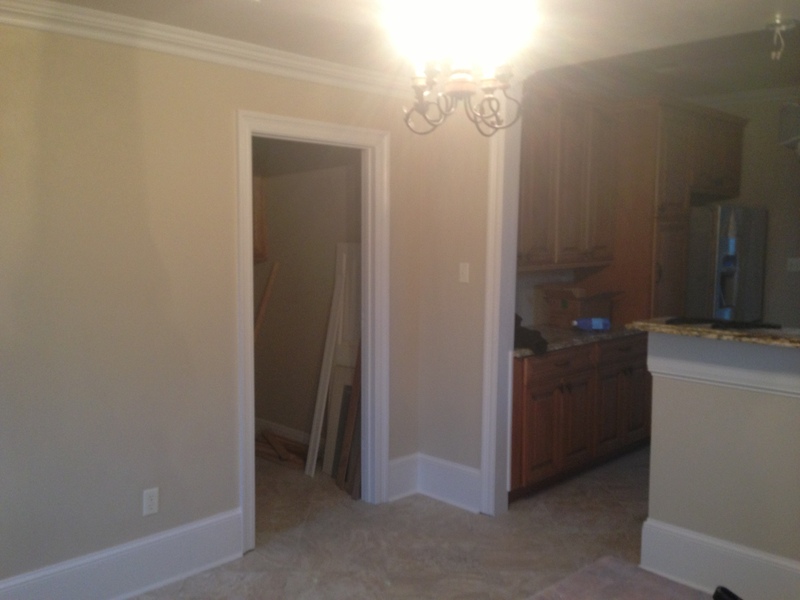 This was a total interior remodel all the way down to the drywall. 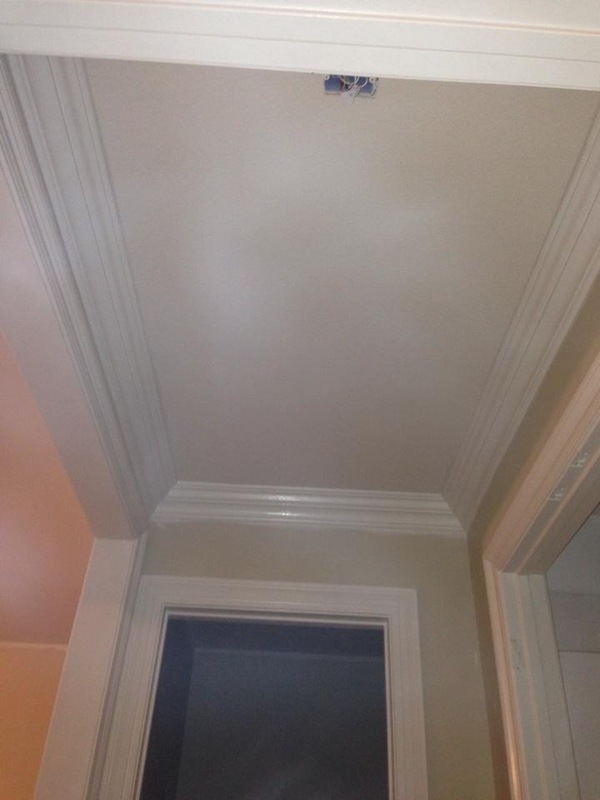 This house was over 40 years old and sunk two or three times from hurricanes. 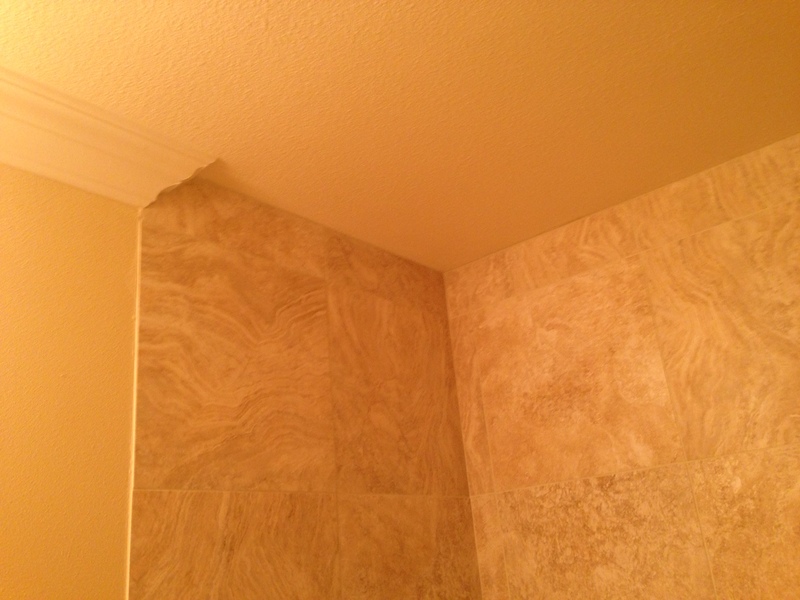 It is an above ground house and was warped badly. 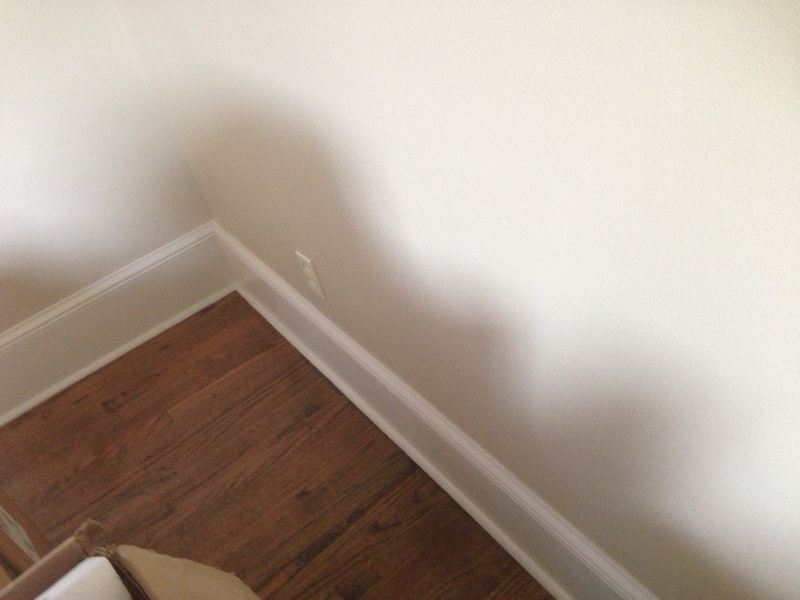 I was a little scared of it when I first looked at it. 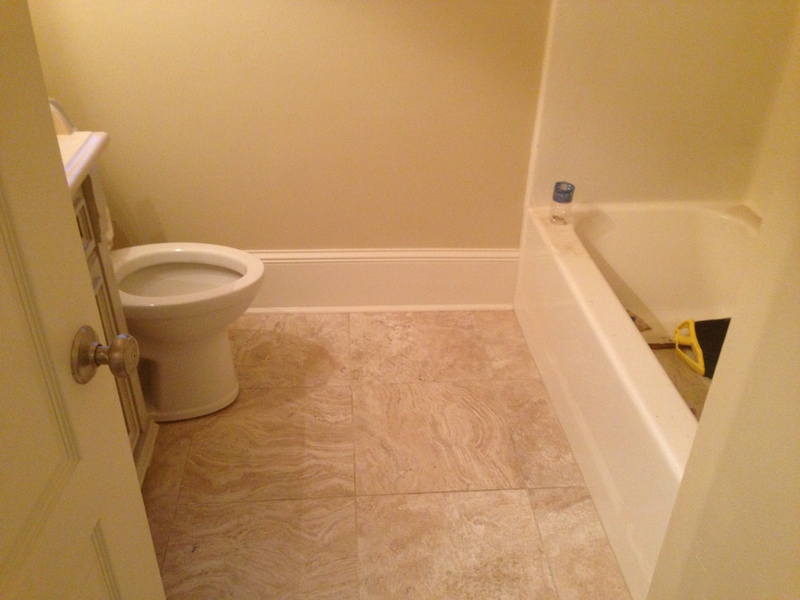 However, this was a friend of mines mother in a bad situation and on a tight budget. 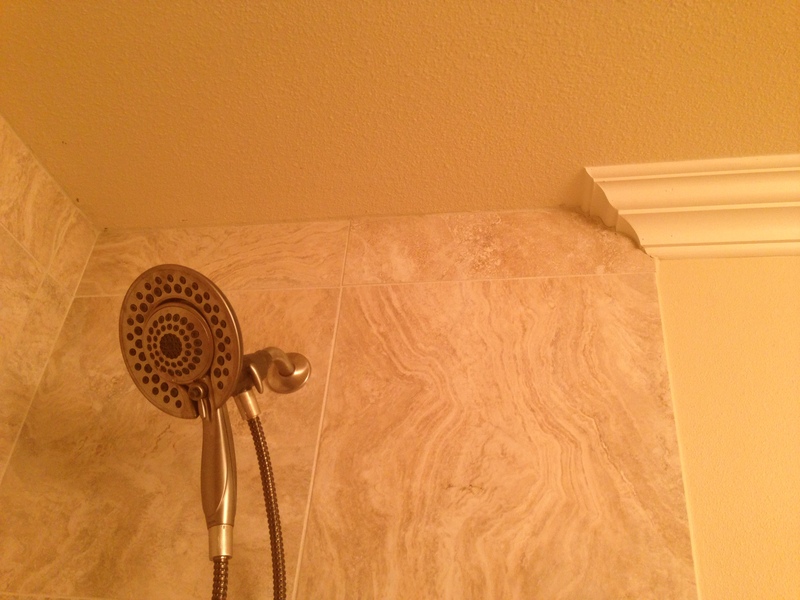 So, I had to step up and help her out. 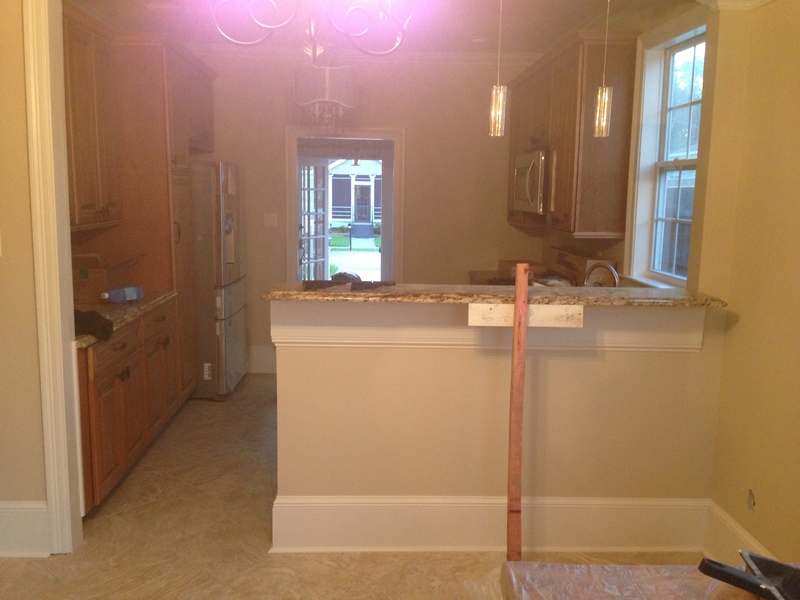 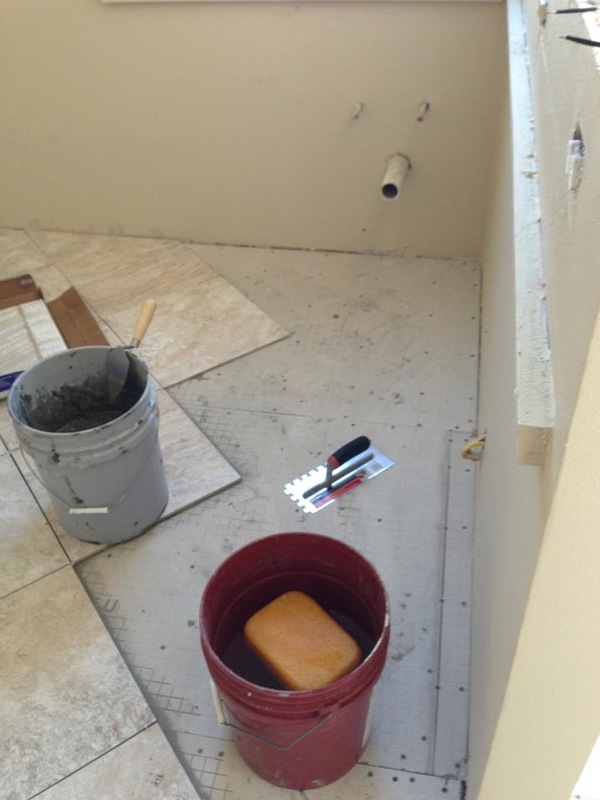 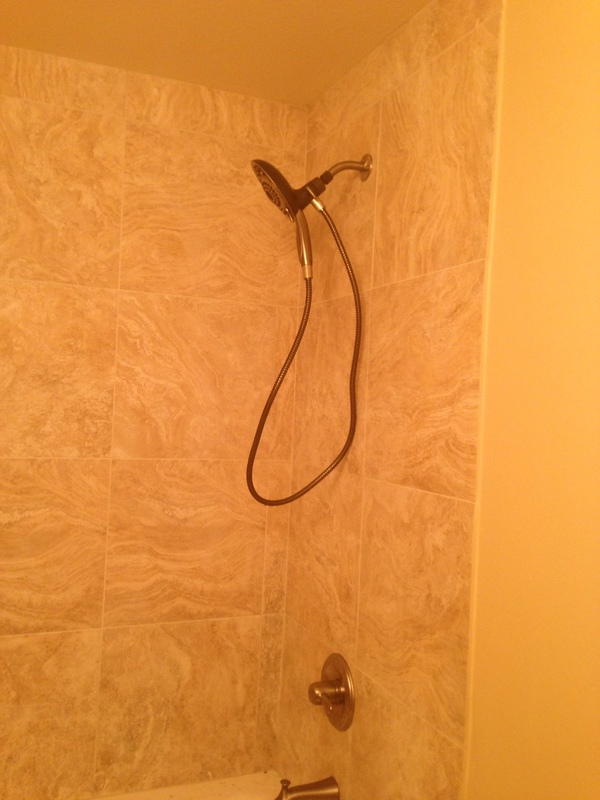 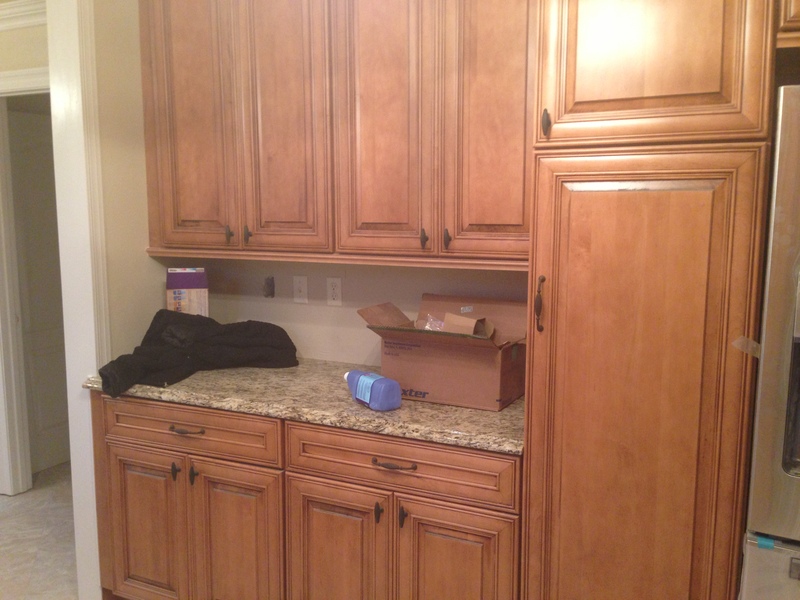 First I am going to show you some pics of the completed project, then I will walk you through the process. 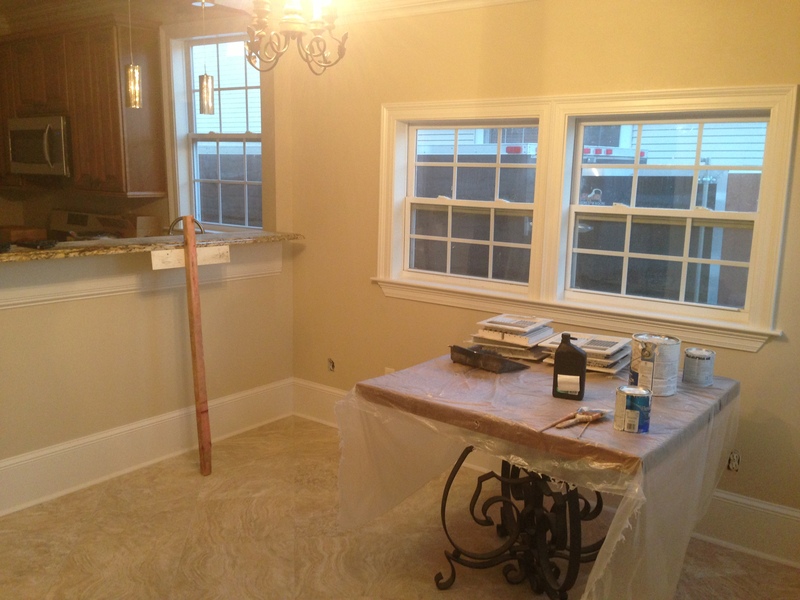 Now, I am going to walk you through the whole process with more pictures. 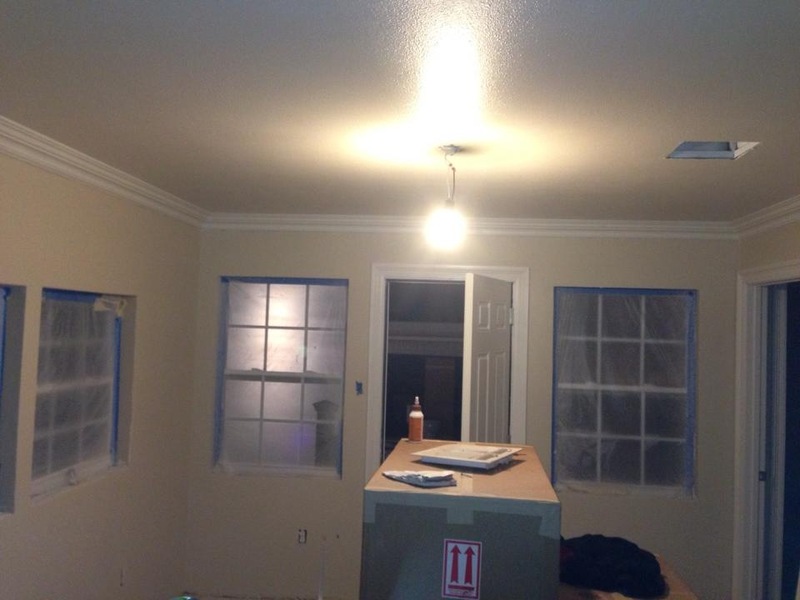 I don’t have very many pictures from the very early stages of this because my phone broke. 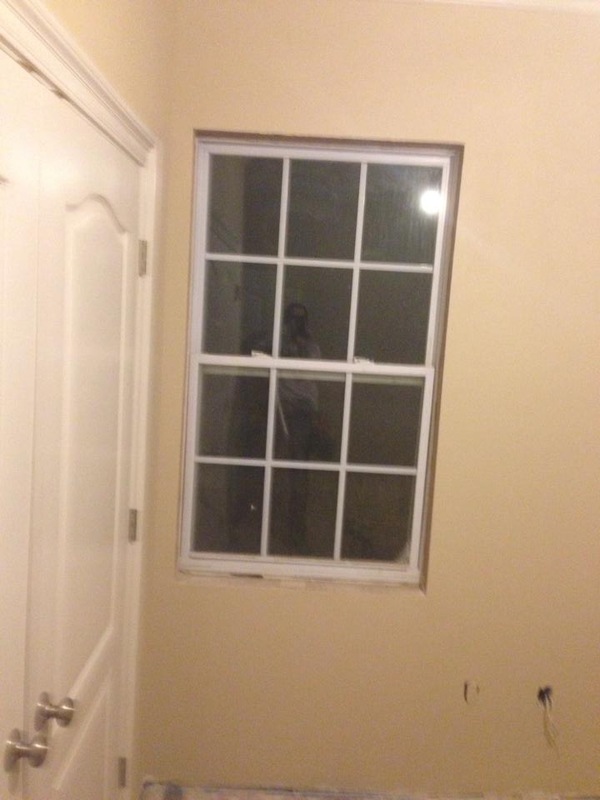 Also, all pics were taken with an iPhone so please excuse the quality of them. 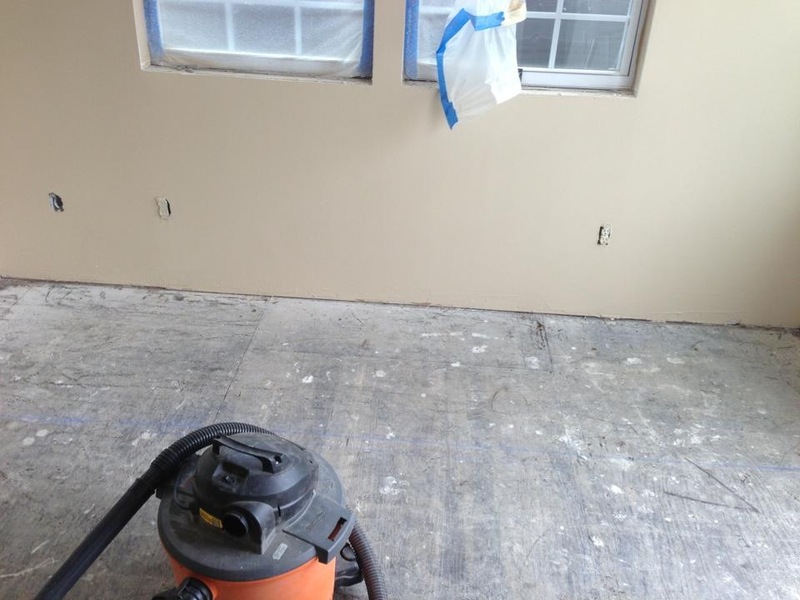 The first thing that we did here was tear out the kitchen and dining room floor. 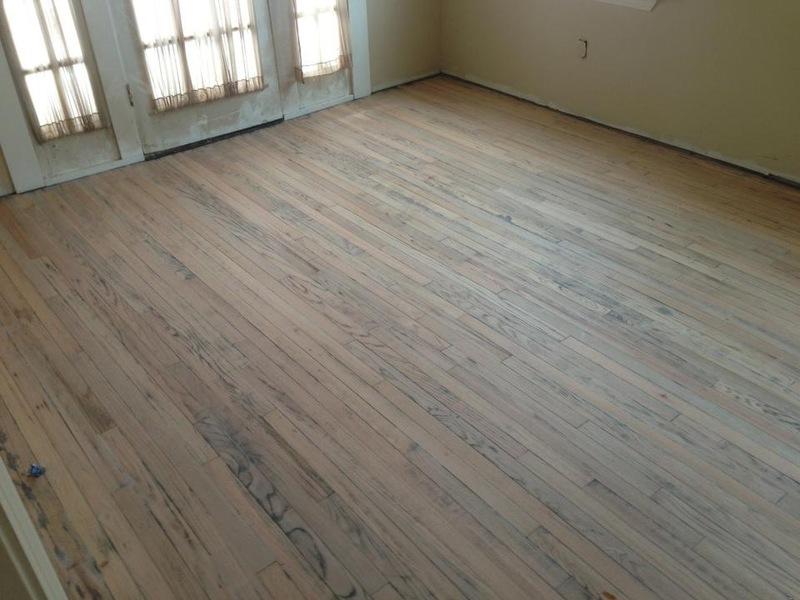 Then we sanded down the living room, hall way, and bedroom floors. 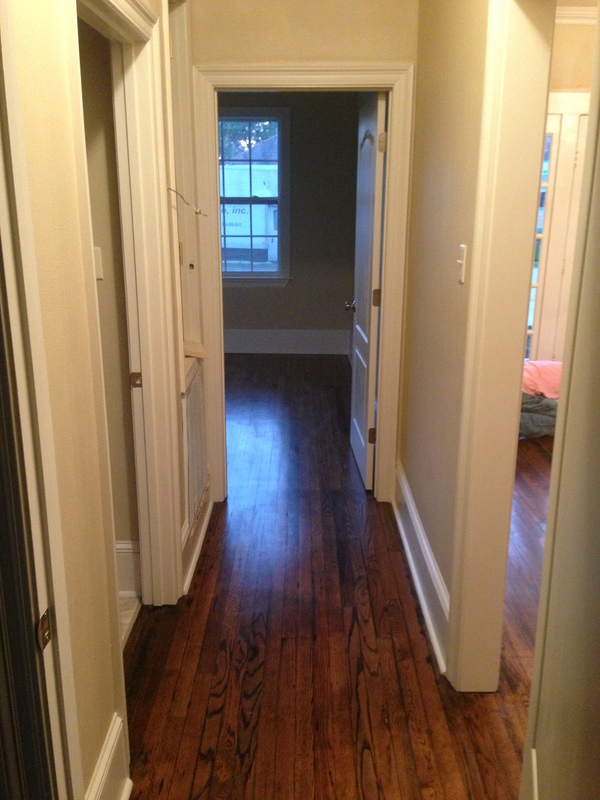 These floors were over 40 years old and were already redone once. 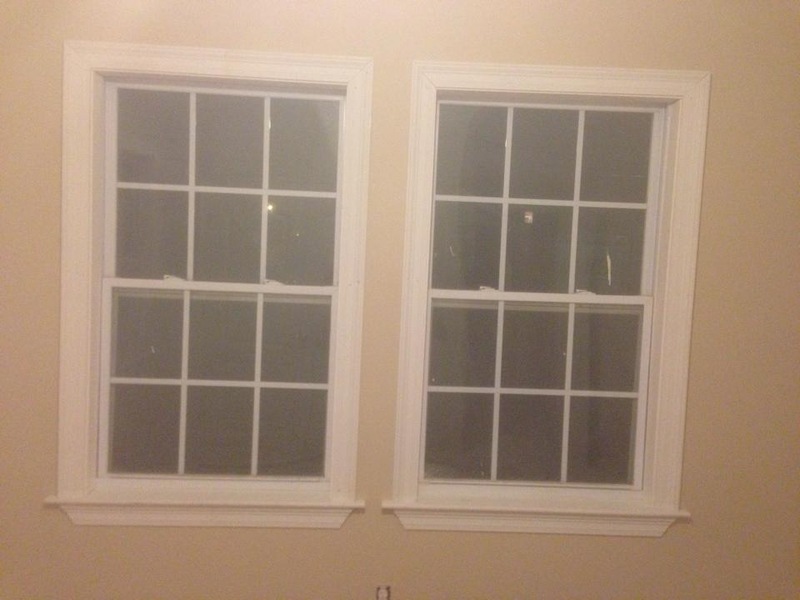 They were in rough shape but the home owner wanted to save them because she did not have the money to replace them. 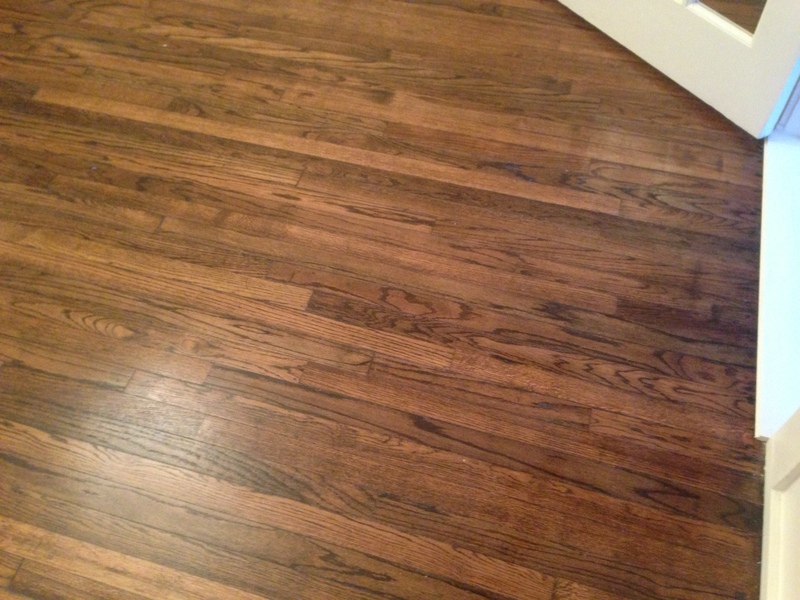 So away we went with the drum sander and got the bulk of the old stain up. 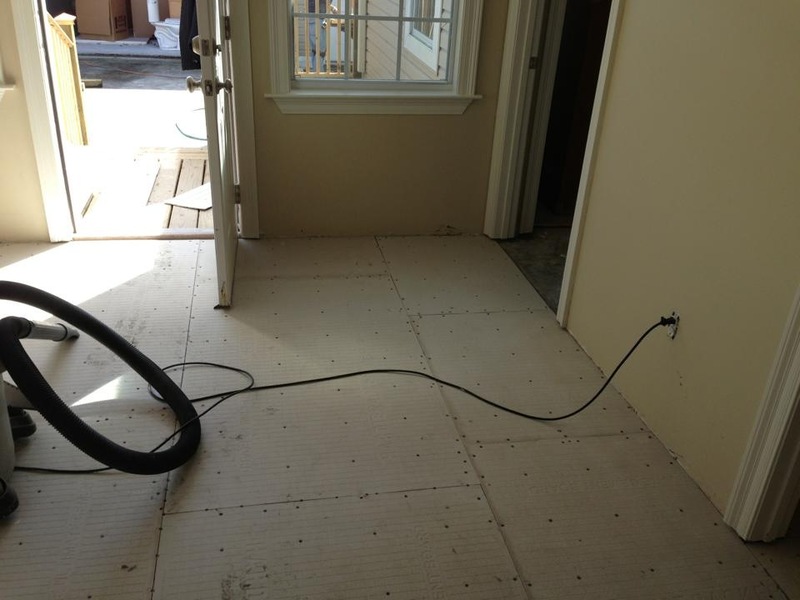 We then covered the floors with paper so that we could paint the house. 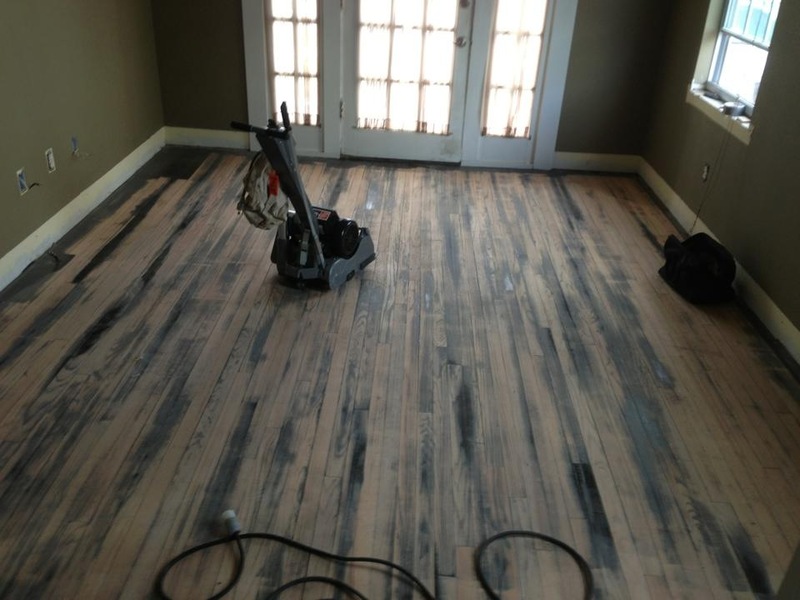 The reason we used the drum sander before painting was because it was very messy. 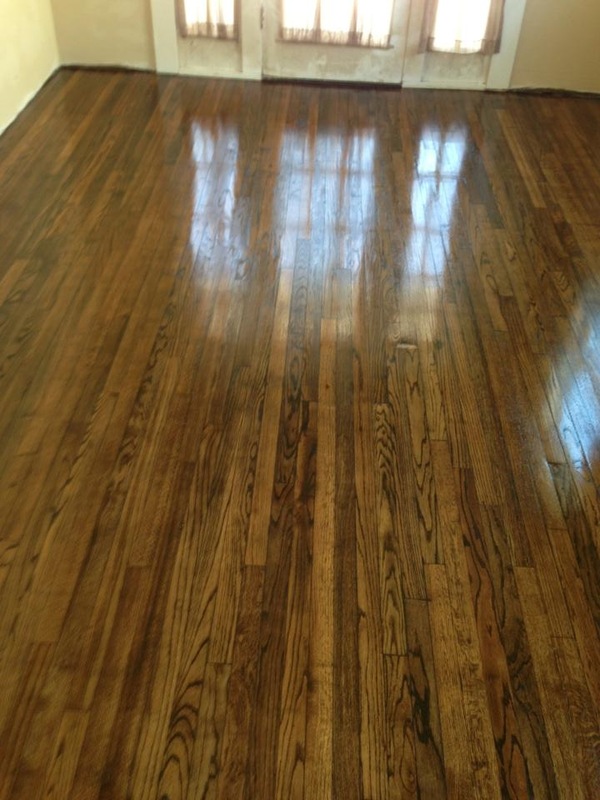 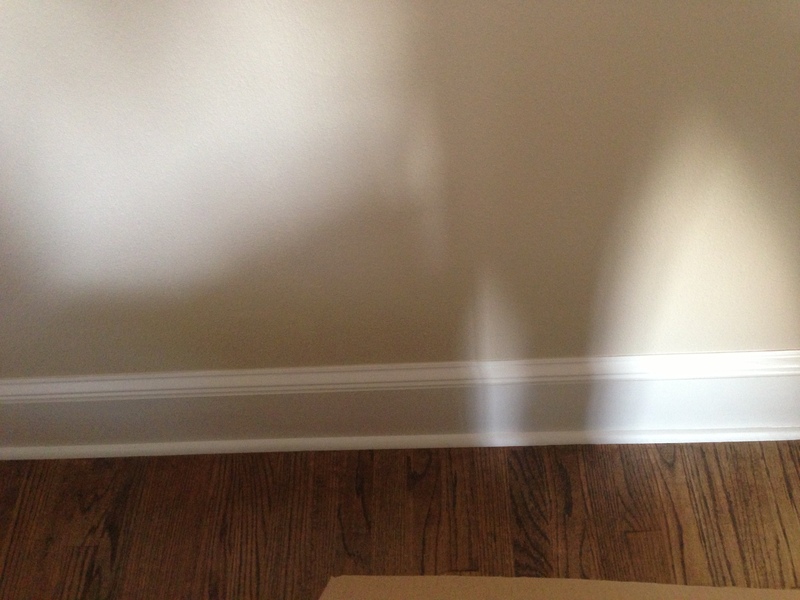 We had to sand the floor a lot because it was last stained dark and the home owner wanted them a semigloss cherry look. 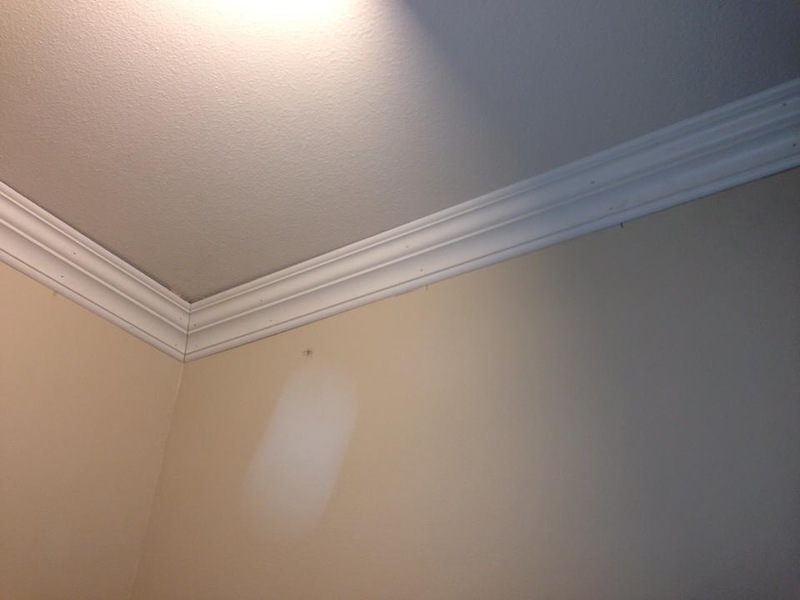 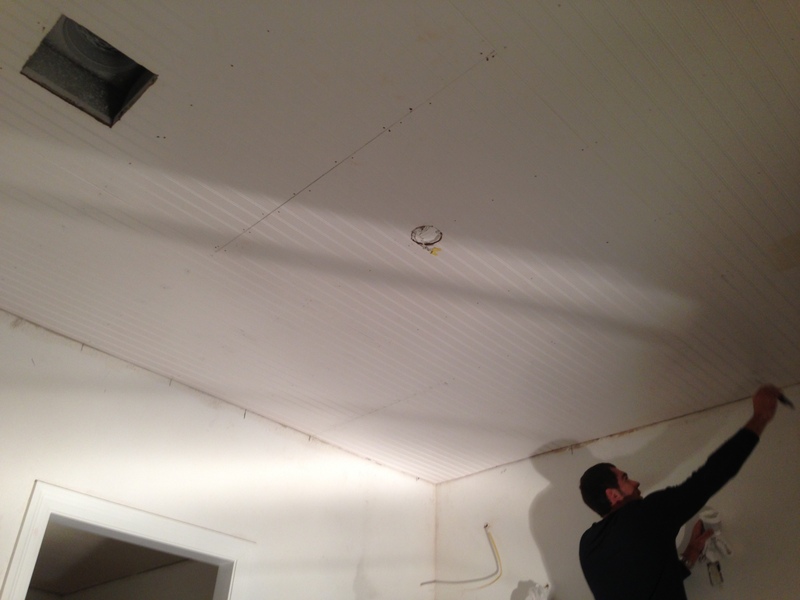 So, after cleaning the dust cloud we had, we patched all the holes in the drywall. 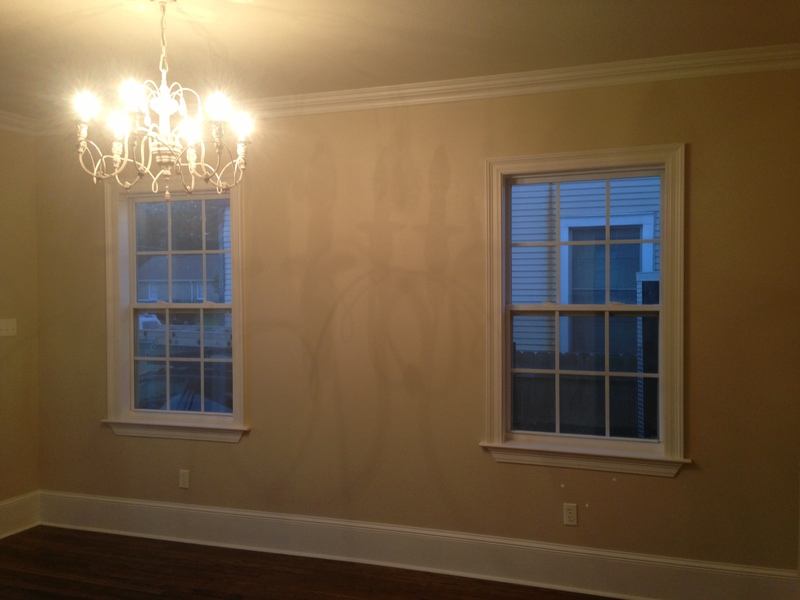 When this dried, we primed then painted all the walls and ceilings. 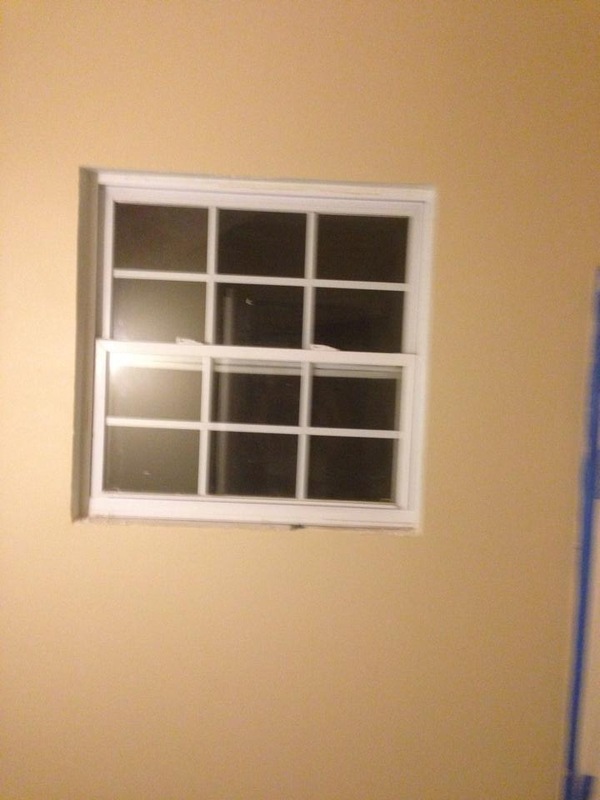 Sorry, these pictures got lost when my phone broke, but you will be able to see the paint job in some of the following pictures. 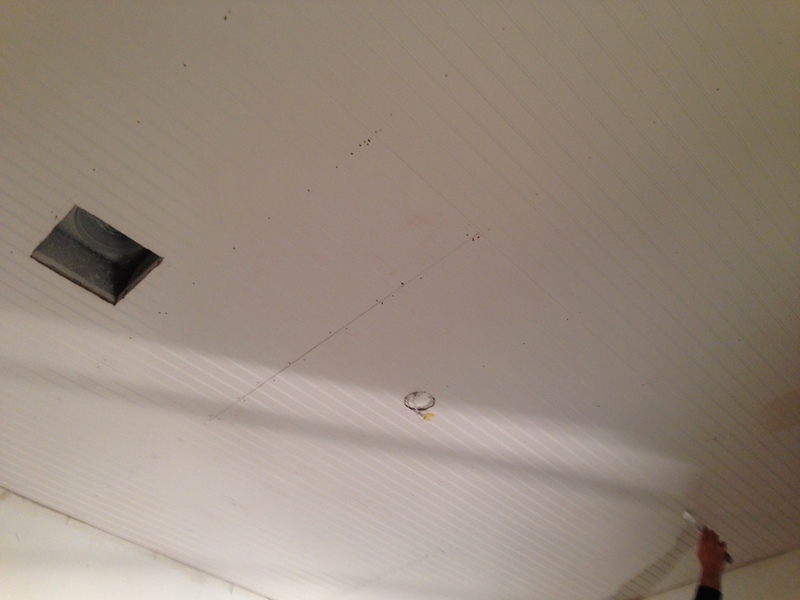 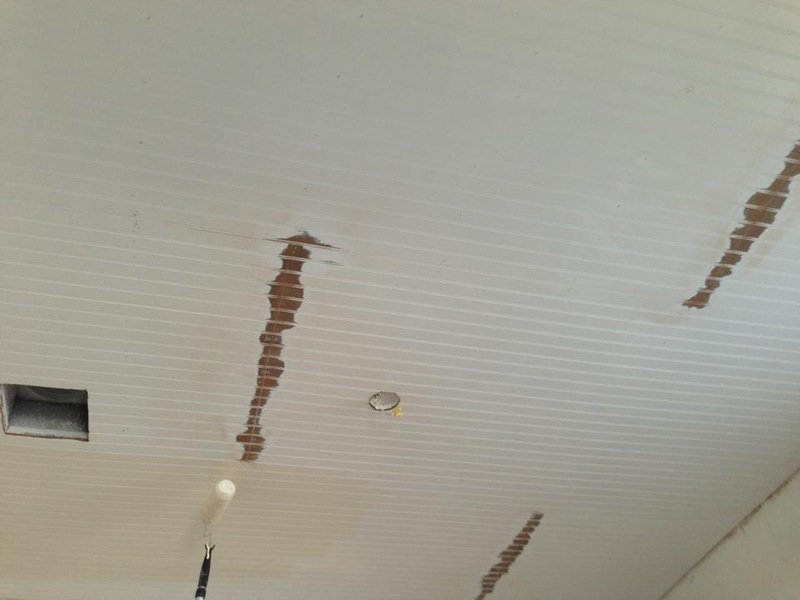 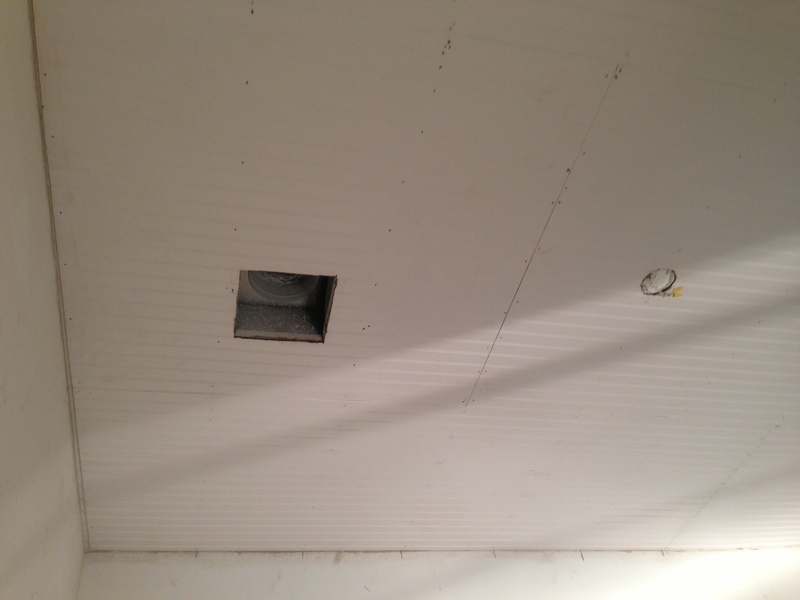 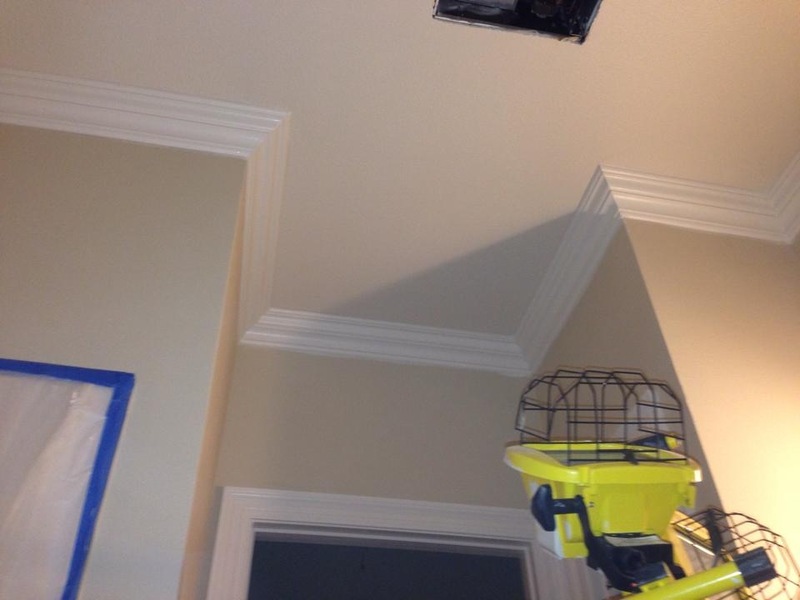 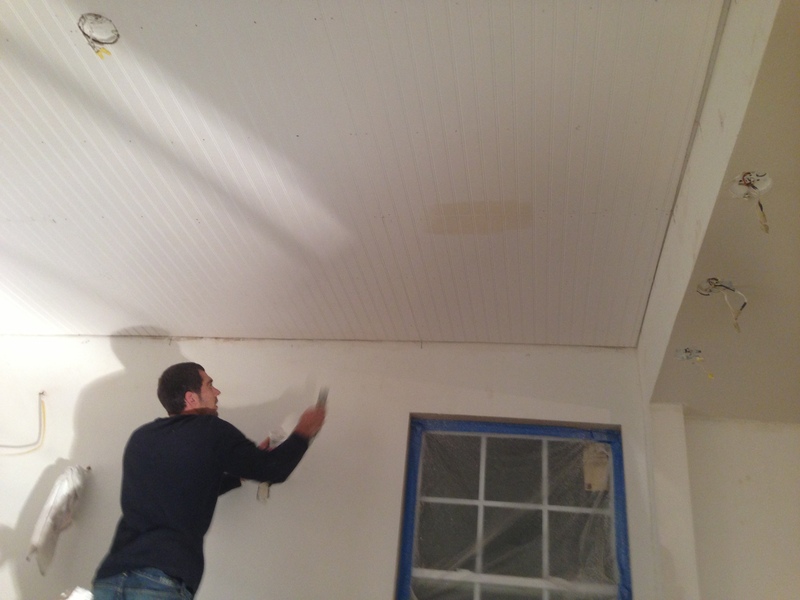 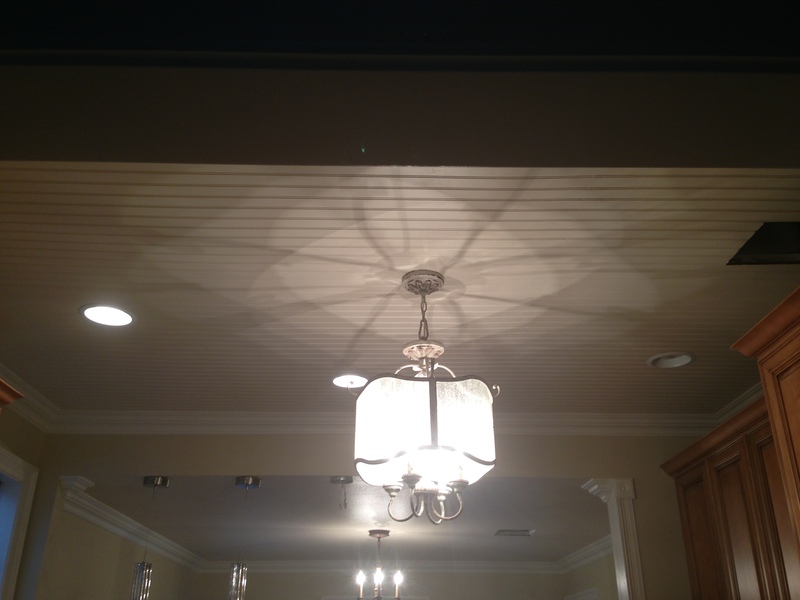 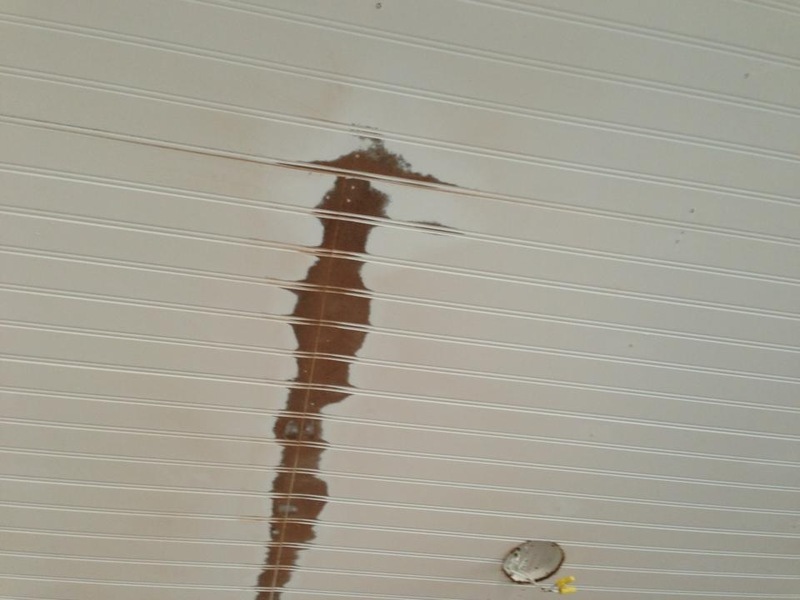 Following the paint, we hung wooden beadboard sheets on the kitchen ceiling. 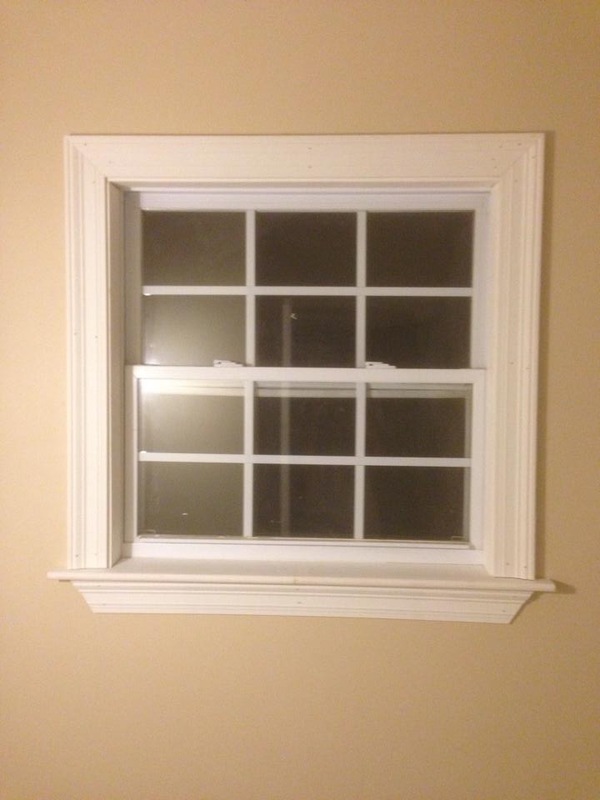 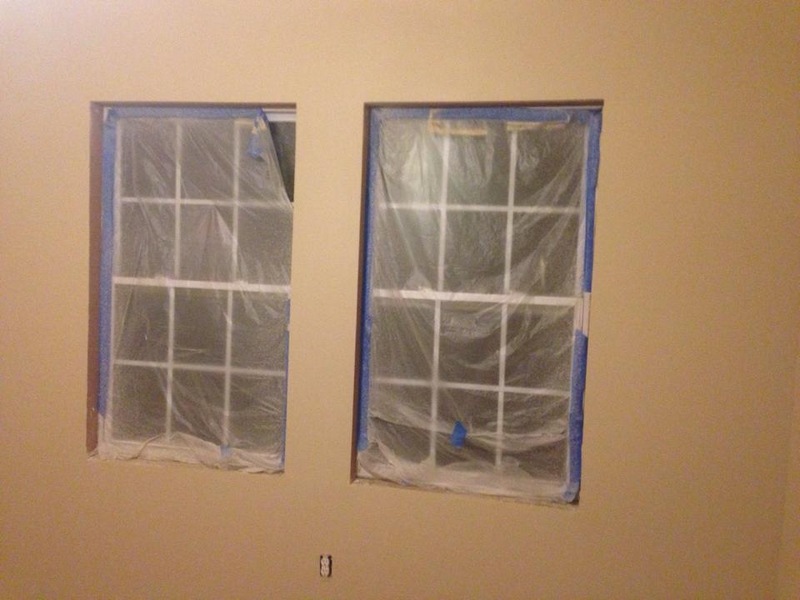 Once we got it hung, we went back and puttied all screw holes and sanded all the seams. 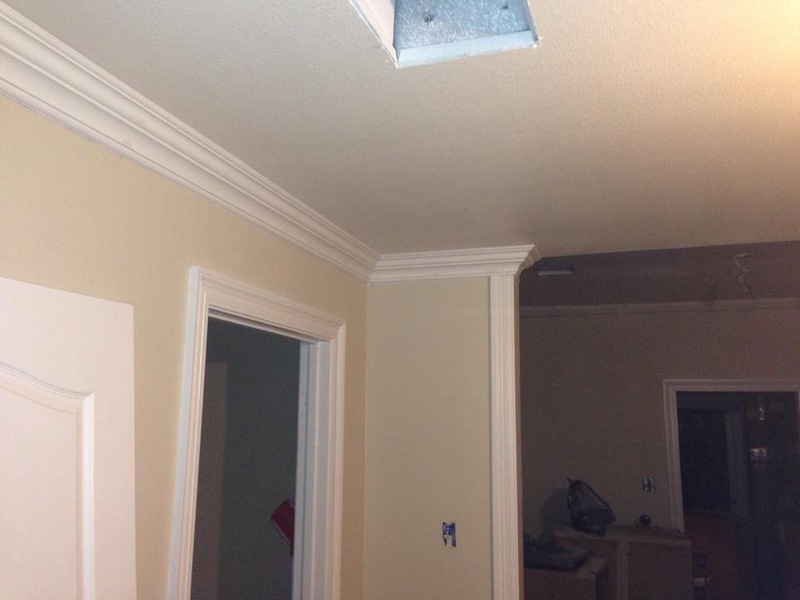 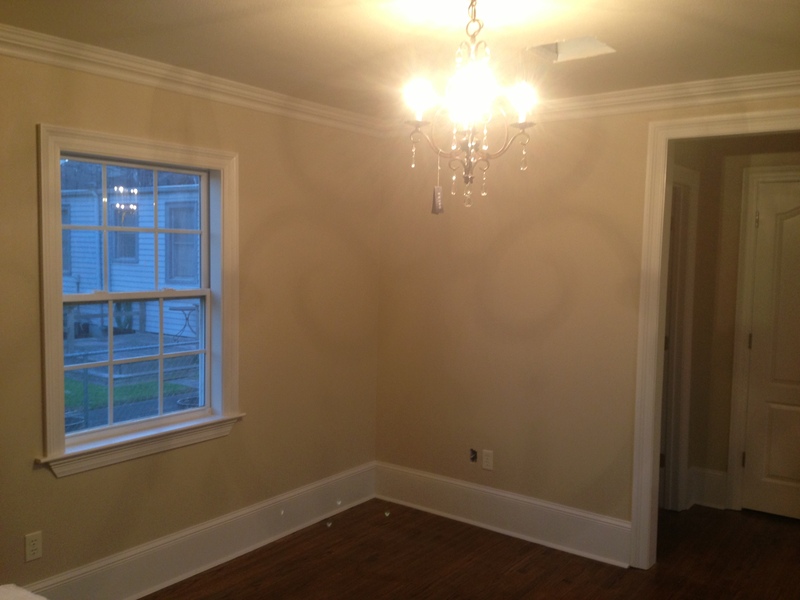 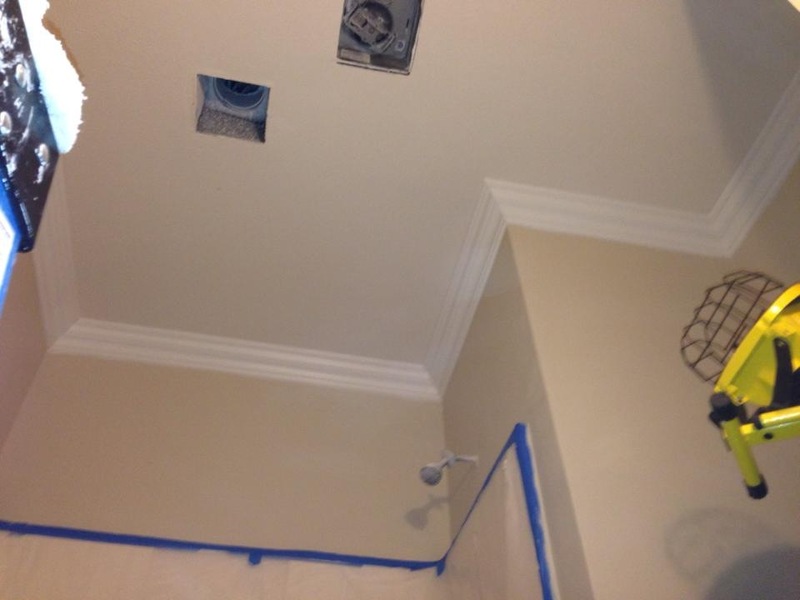 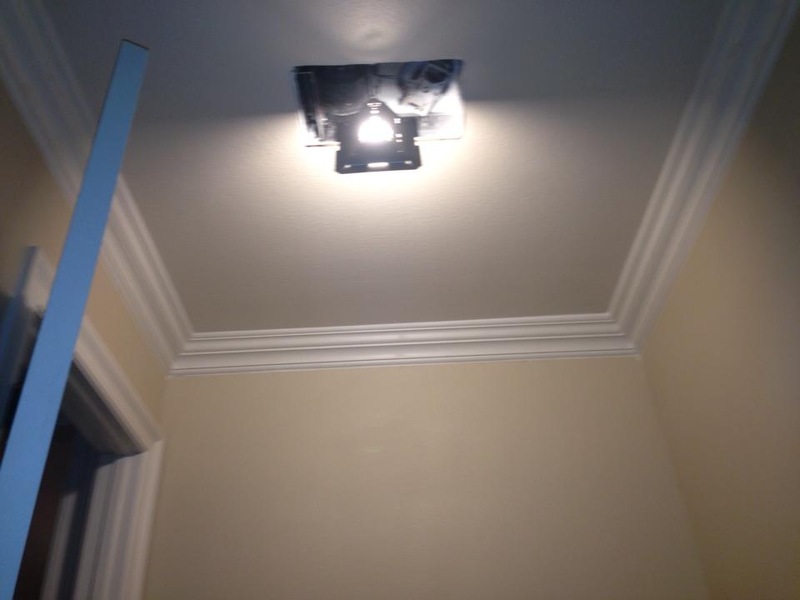 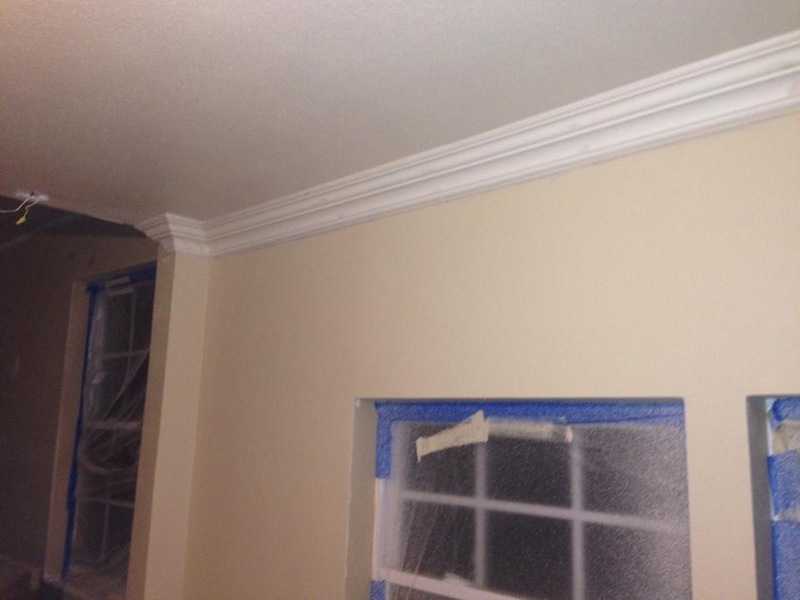 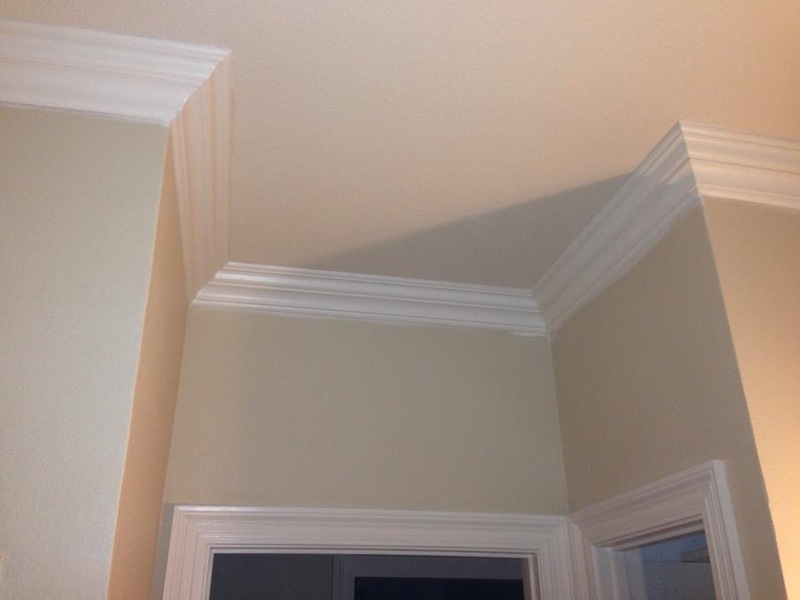 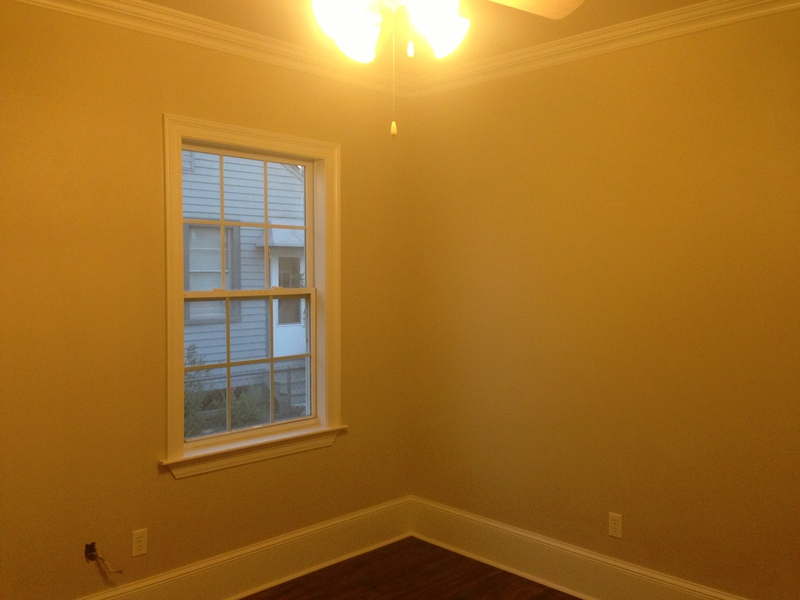 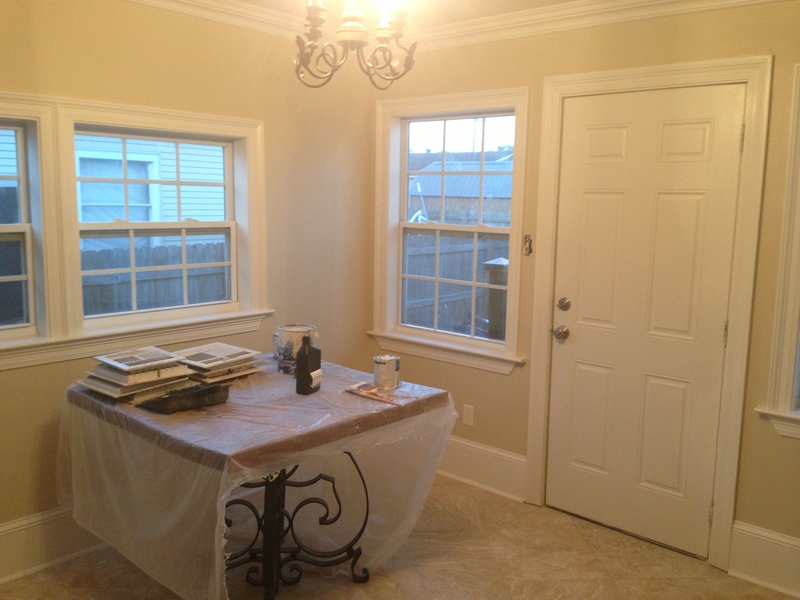 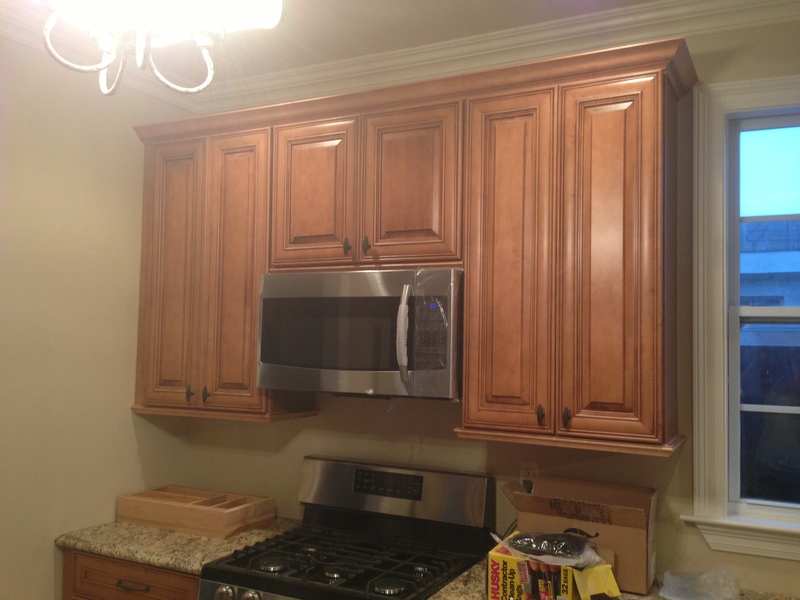 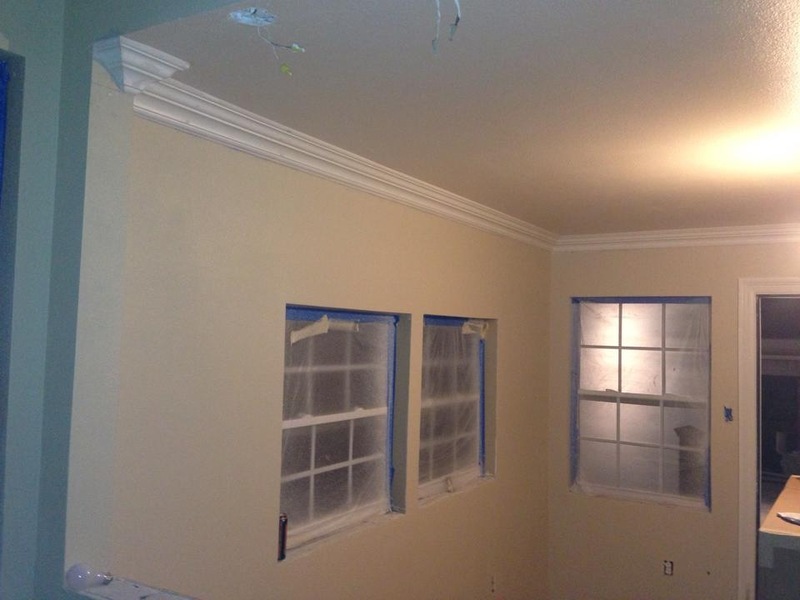 From there, we hung and painted the crown molding and door casings. 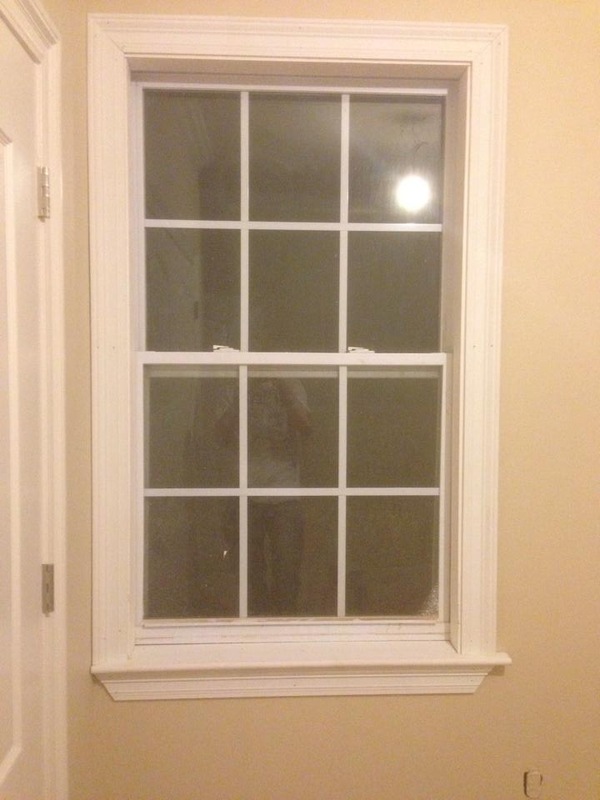 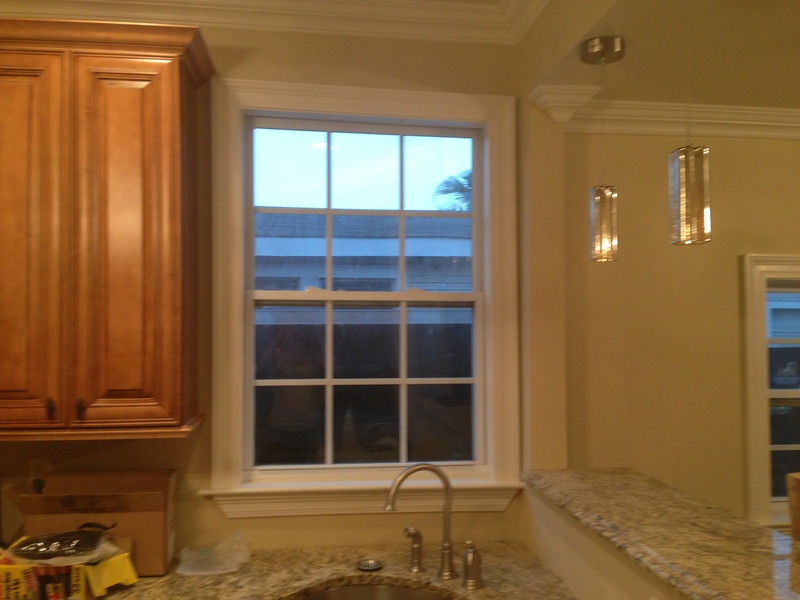 Next, we cased in all the windows. 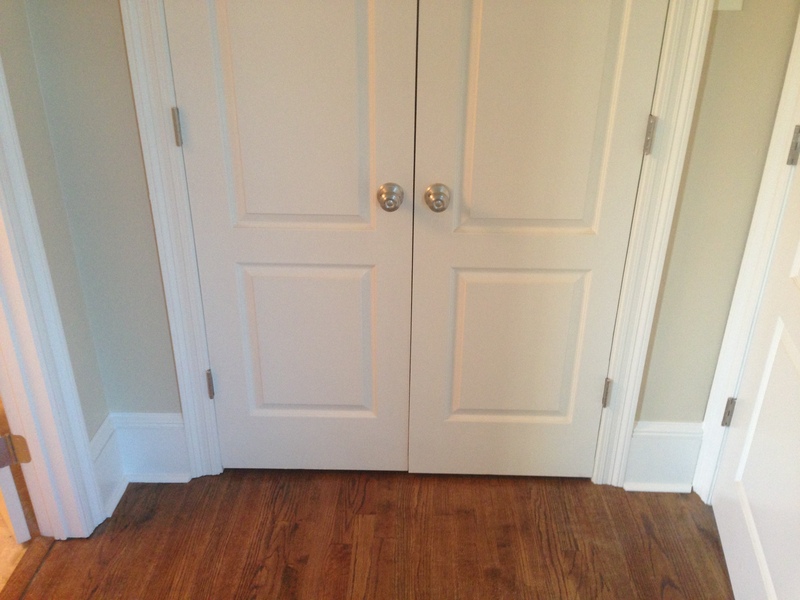 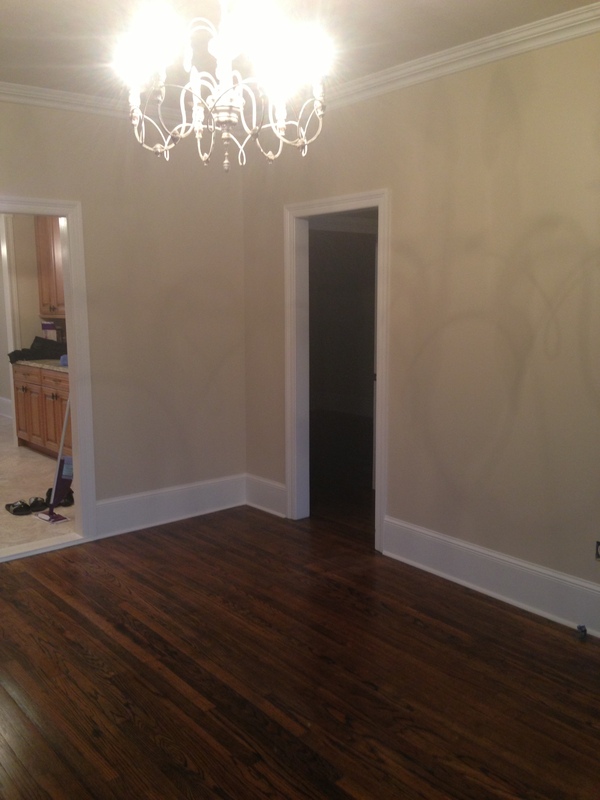 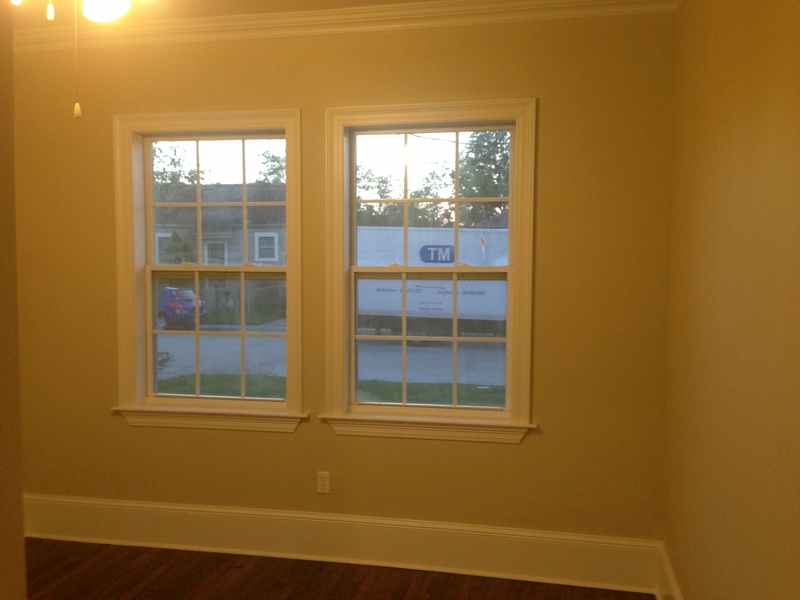 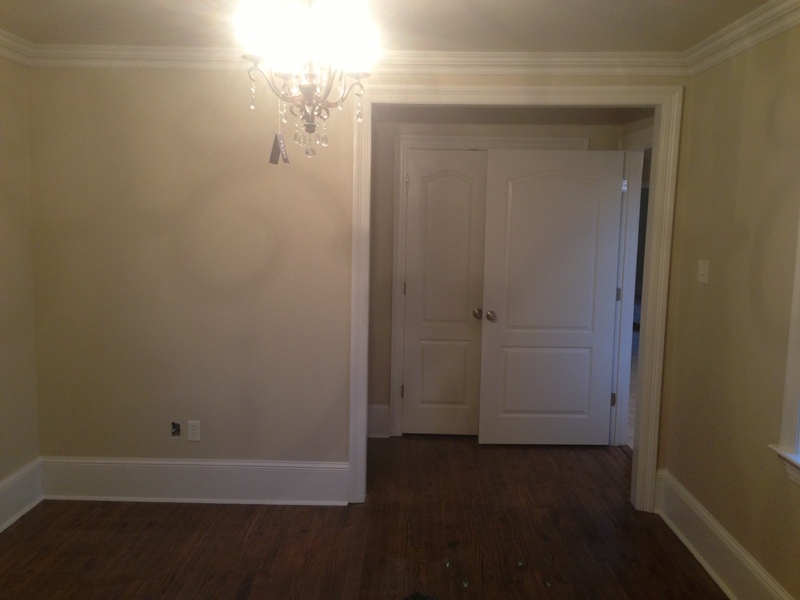 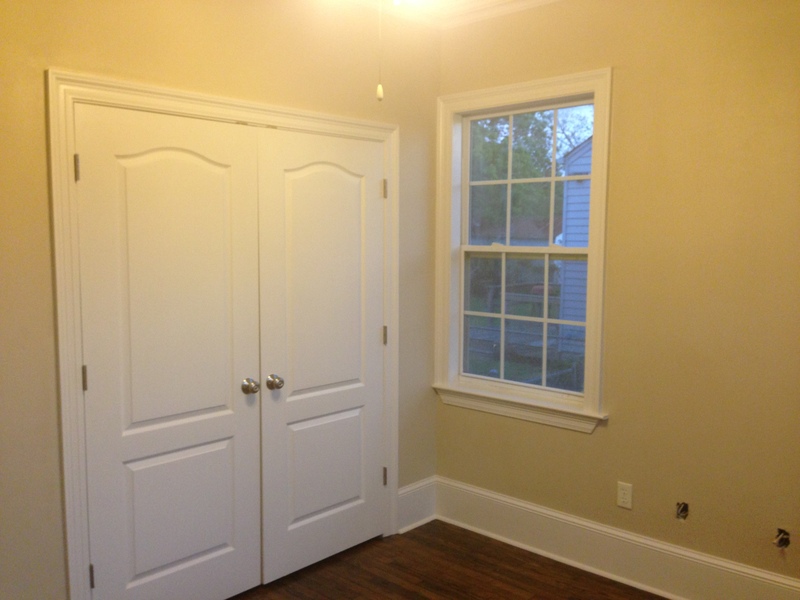 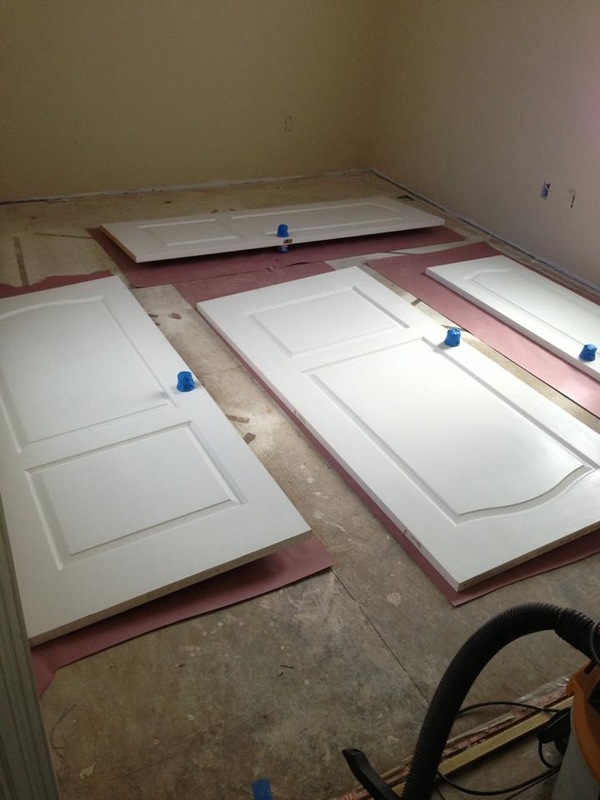 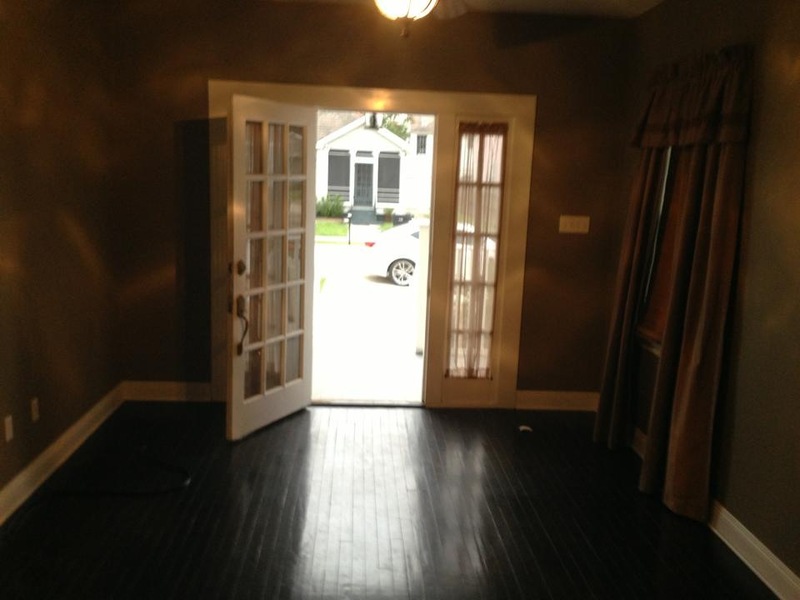 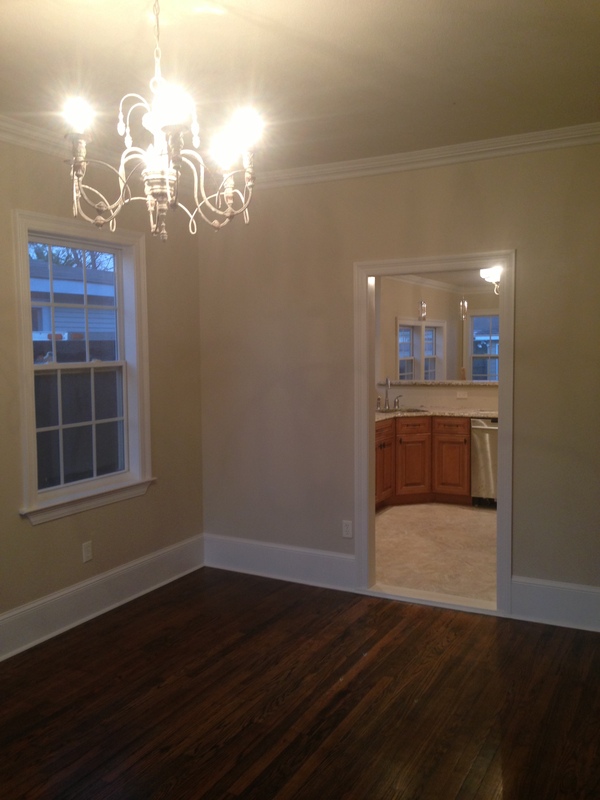 When we finished this, we painted all the doors and moved on to the floors. 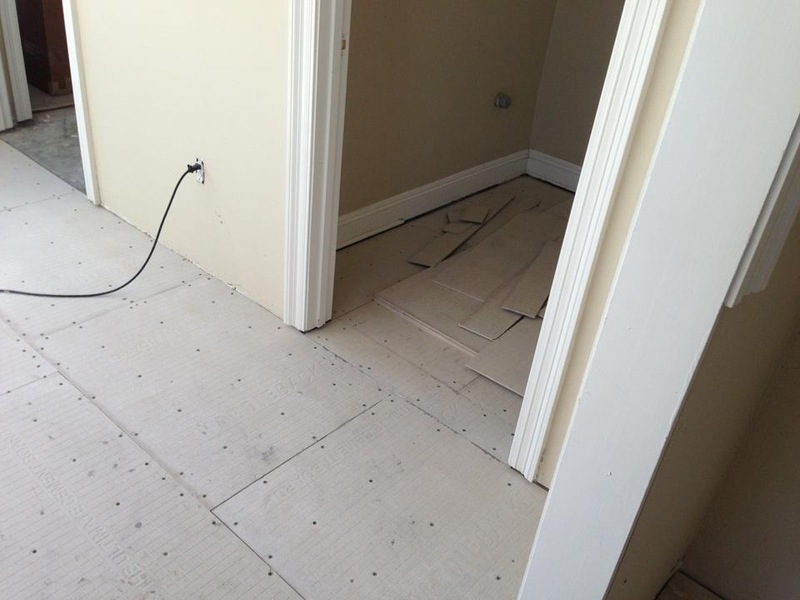 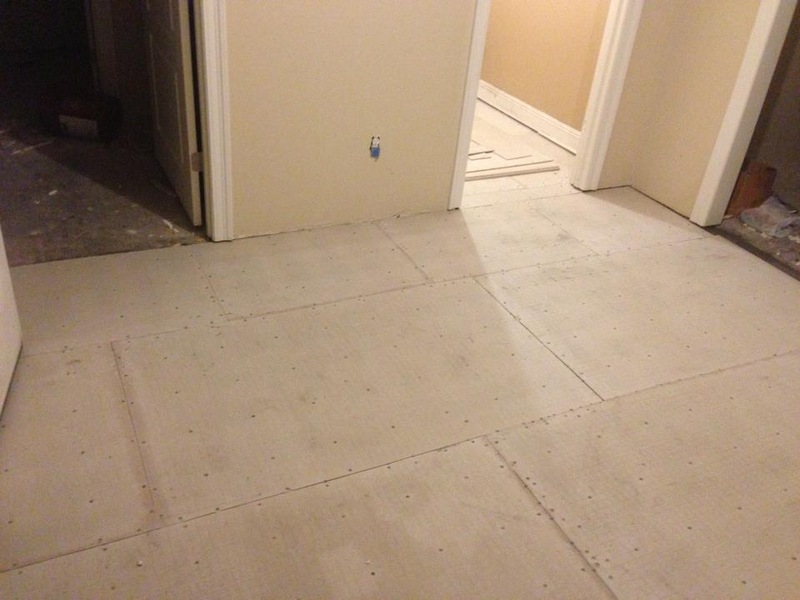 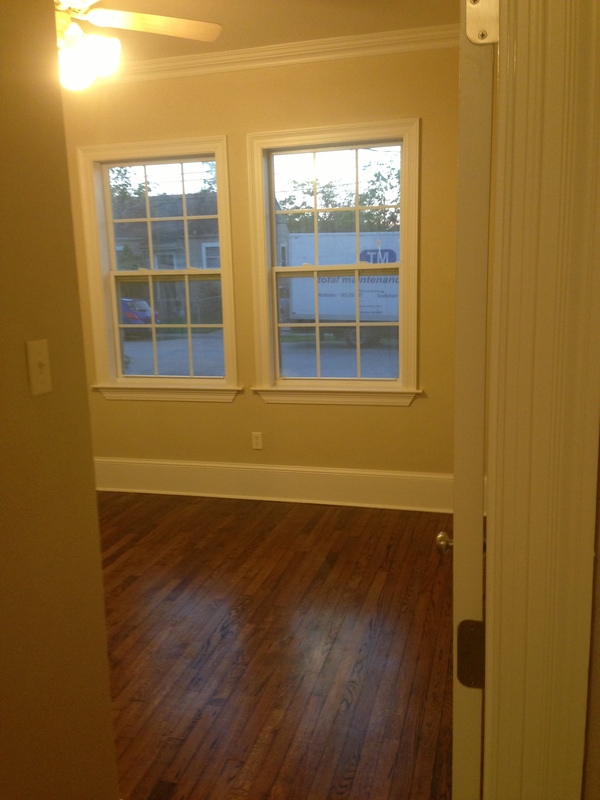 We began the floors by laying hardy board in the dining room, kitchen, and bathroom floors. 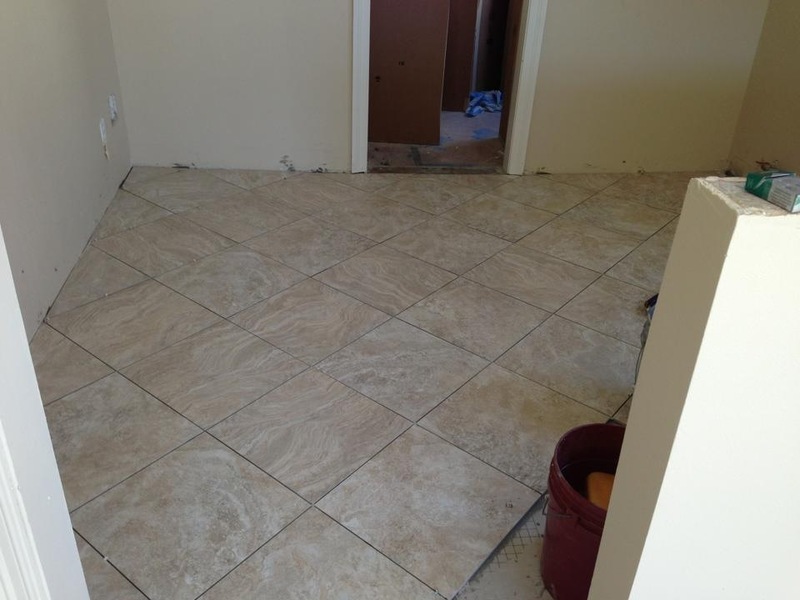 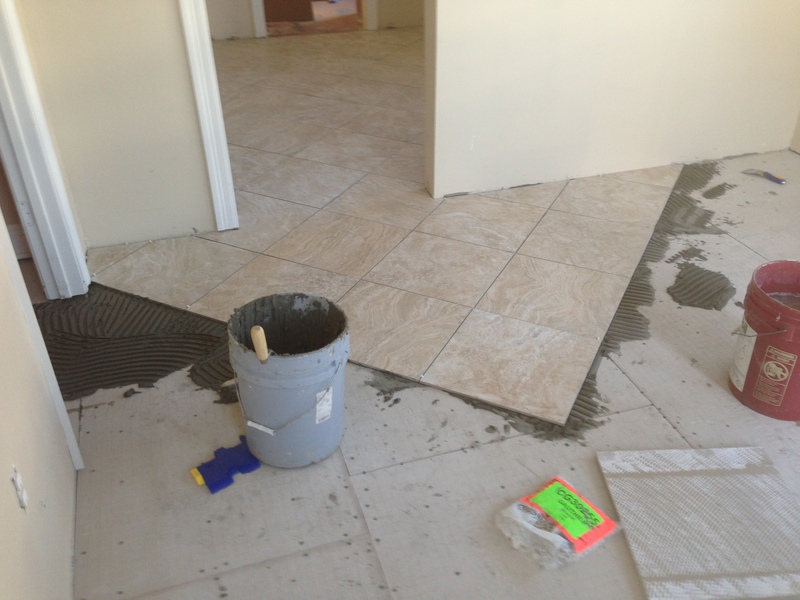 Then, we cleaned the floors and got all the dust up then laid the tile. 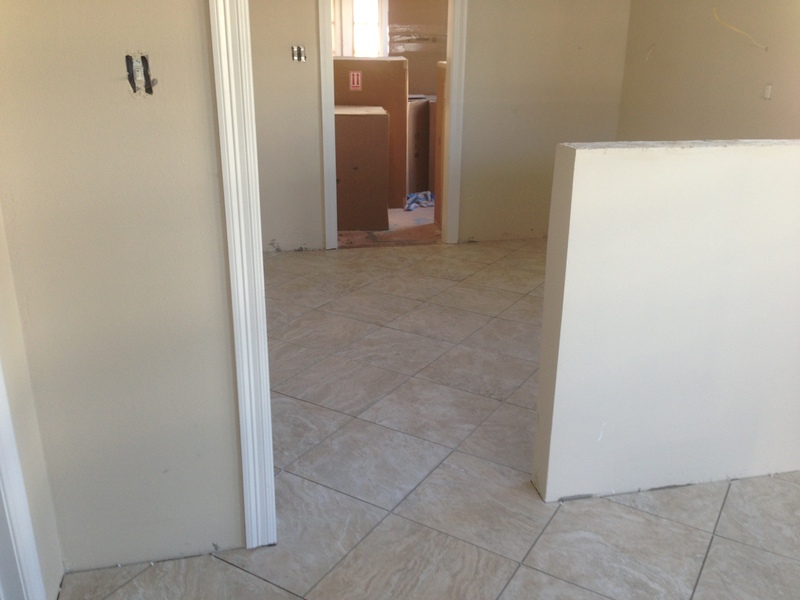 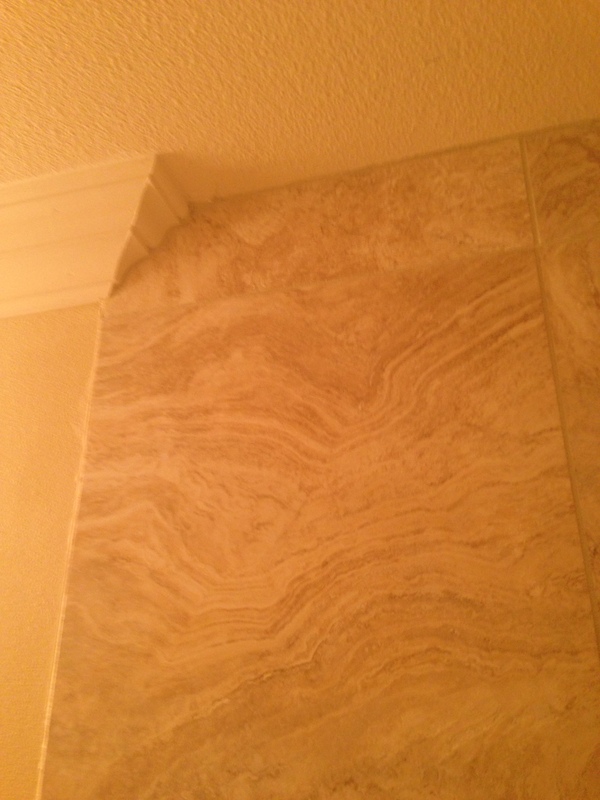 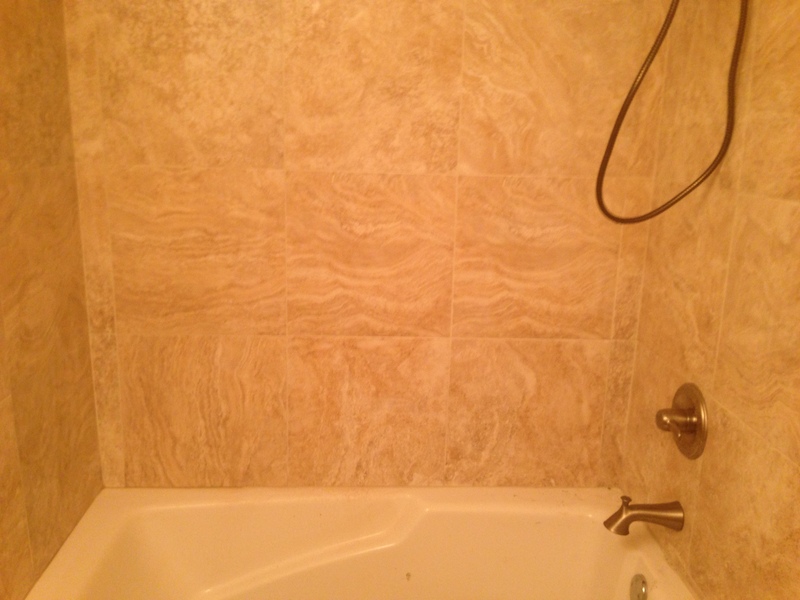 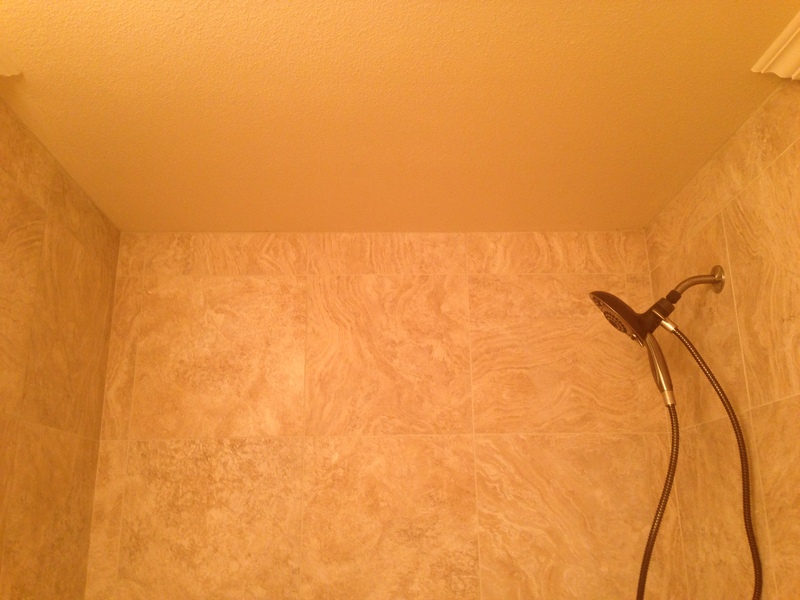 I really liked how the tile came out because they were big 18”x18” and we ran them on a diagonal. 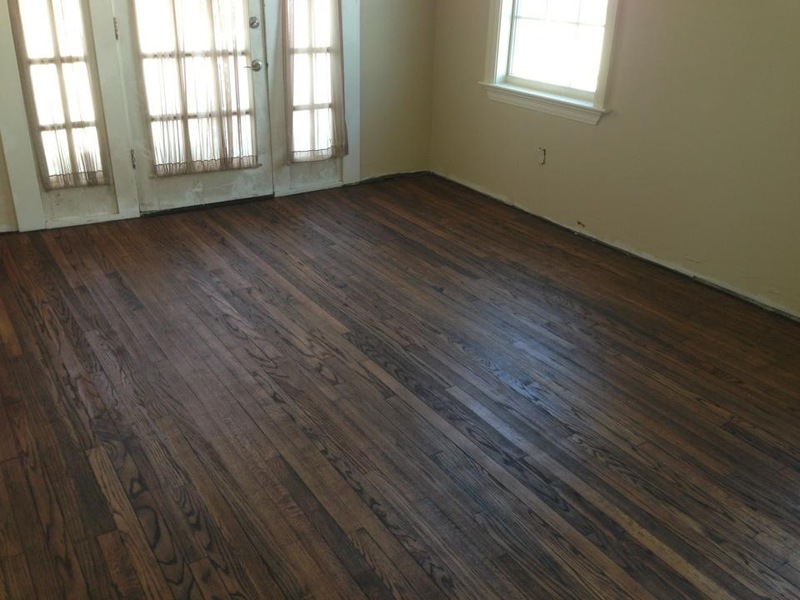 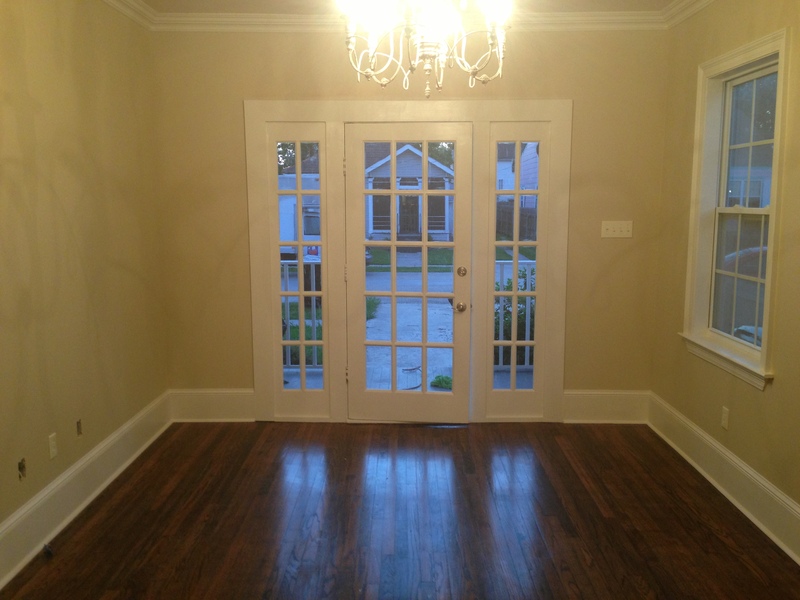 When we finished the ceramic, we uncovered the wood floors in the living room and bedrooms, did a final sand, stained and polyurethaned them with semi-gloss clear coat. 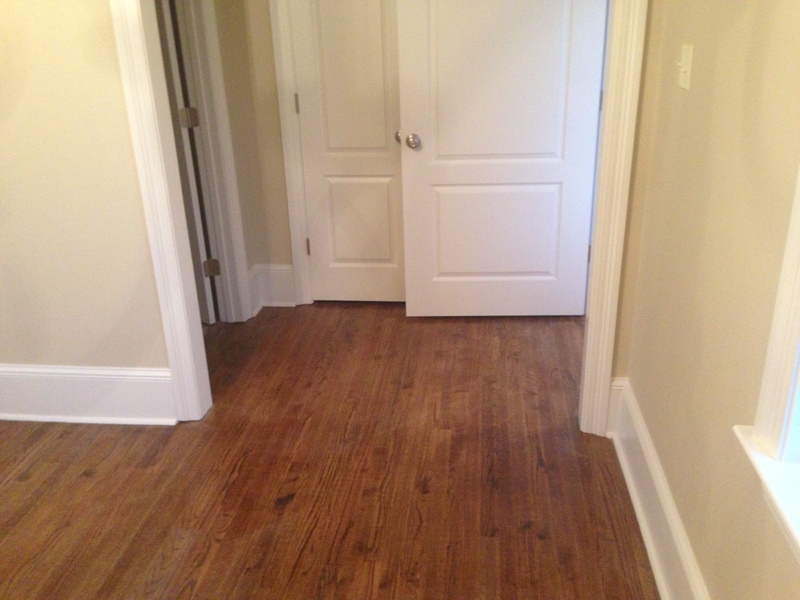 We also laid a new wooden floor in the master bedroom, but unfortunately I can’t seem to find any of the pictures of the master bedroom. 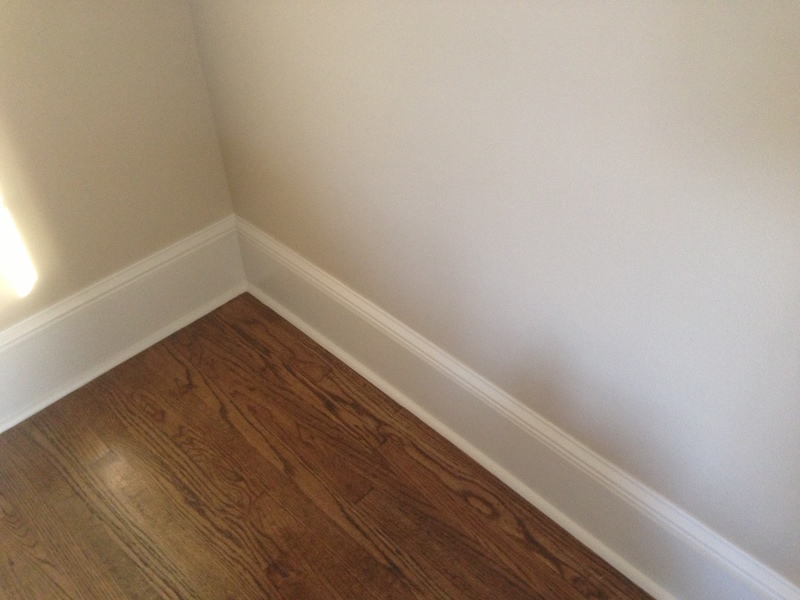 Now it was time to lay the baseboards. 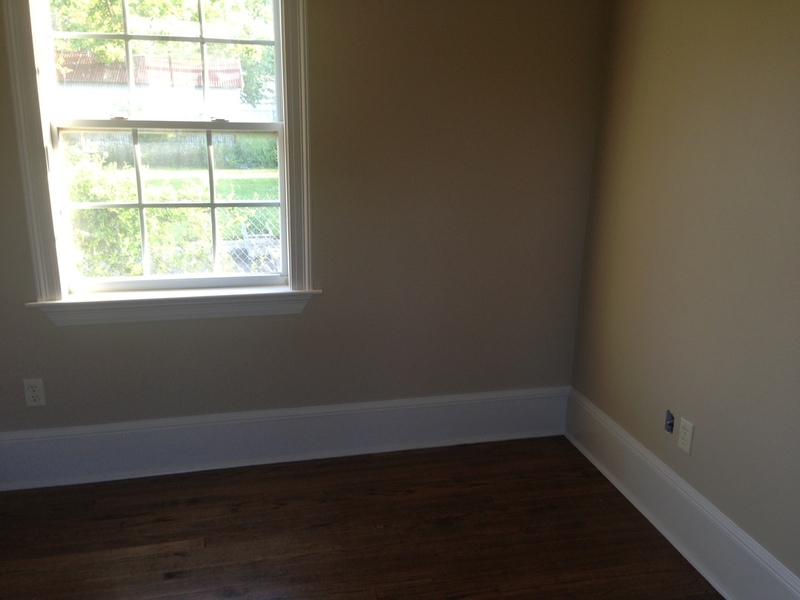 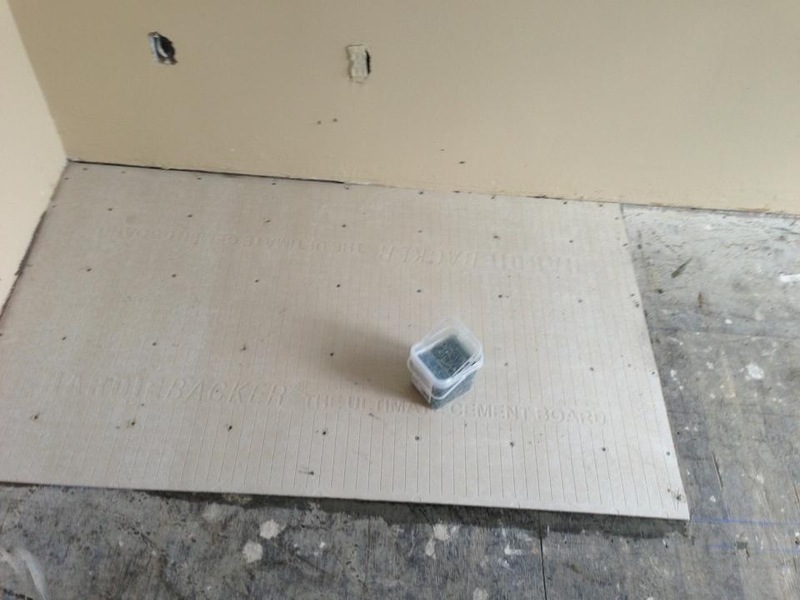 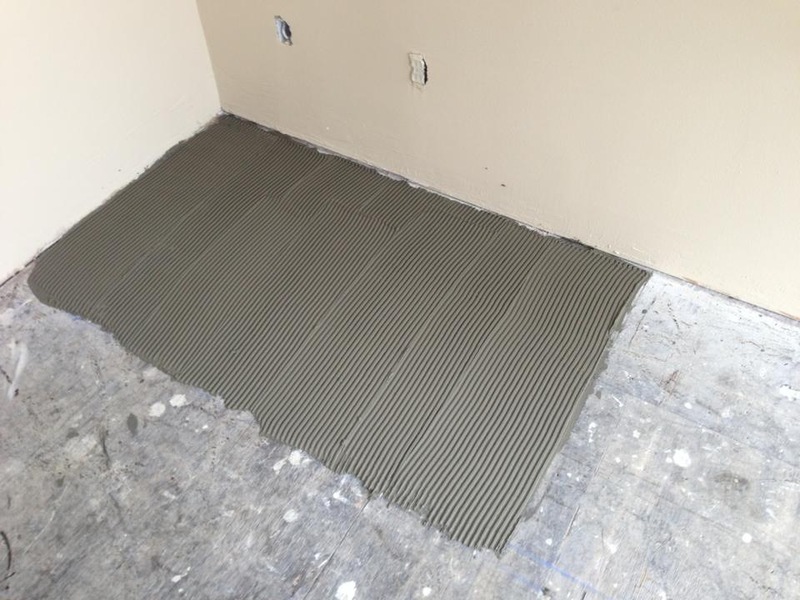 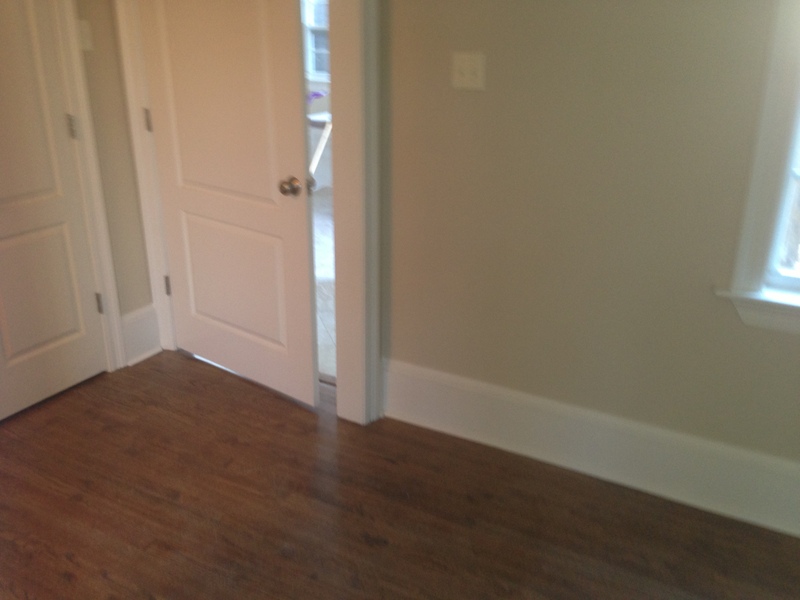 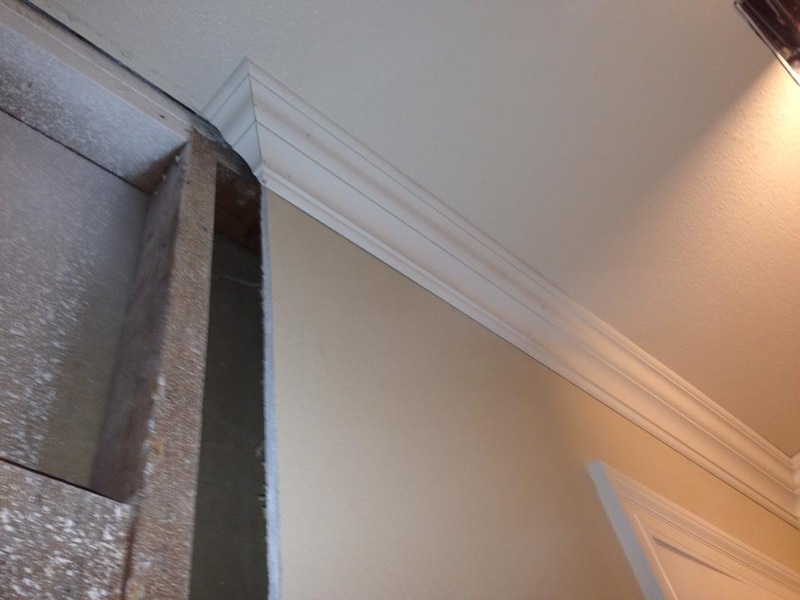 Here we built a three piece baseboard consisting of a 1”x8”, base cap, and toe board.